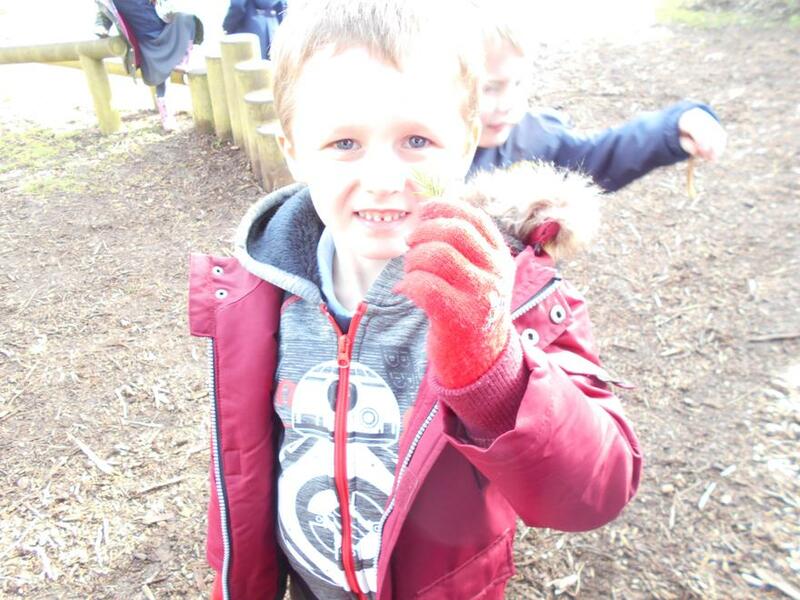 The children had a super time at Uncle Henry's from exploring how to make sausages to going on forest walks. 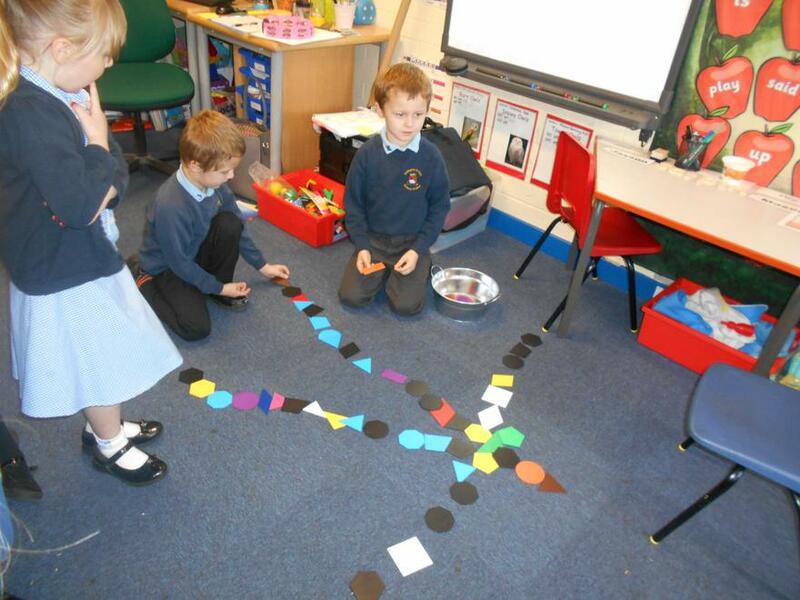 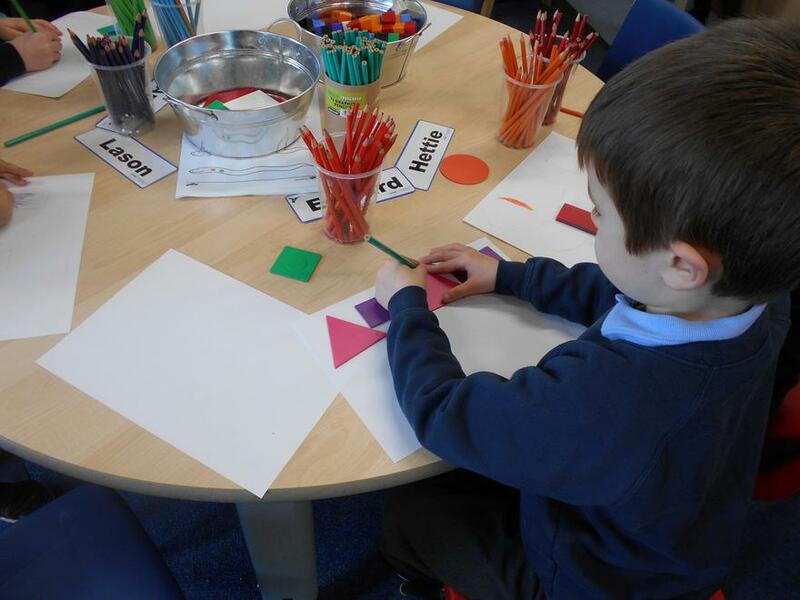 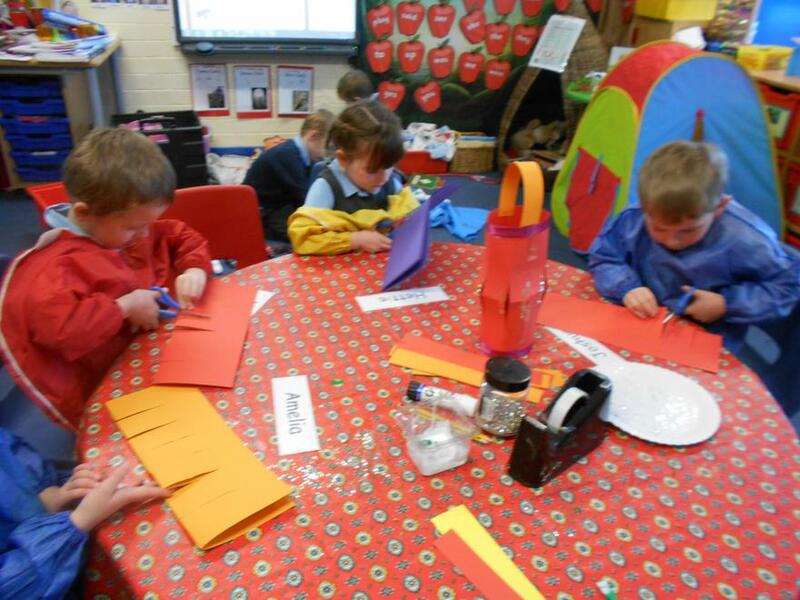 The children have been very busy creating their very own versions of Matisse's Snail out of 2D shapes. 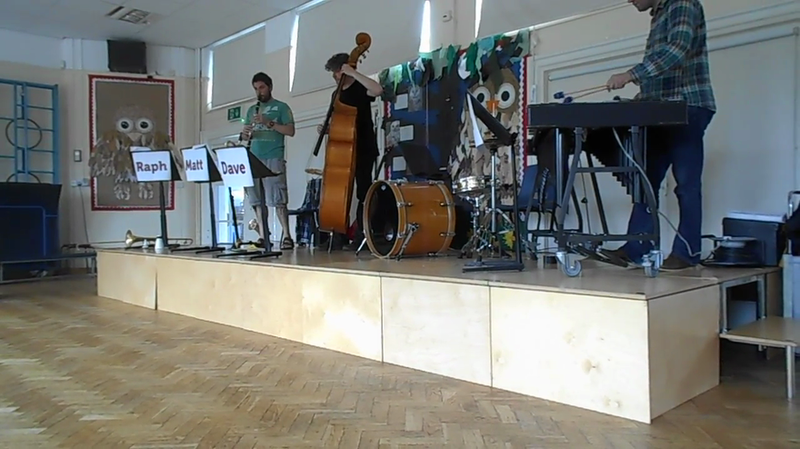 The Children were treated to an afternoon of Jazz Music! 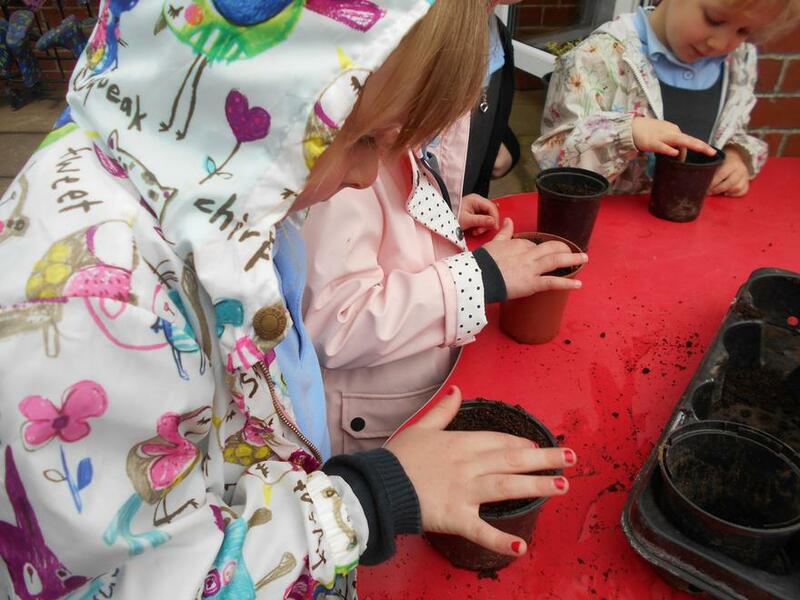 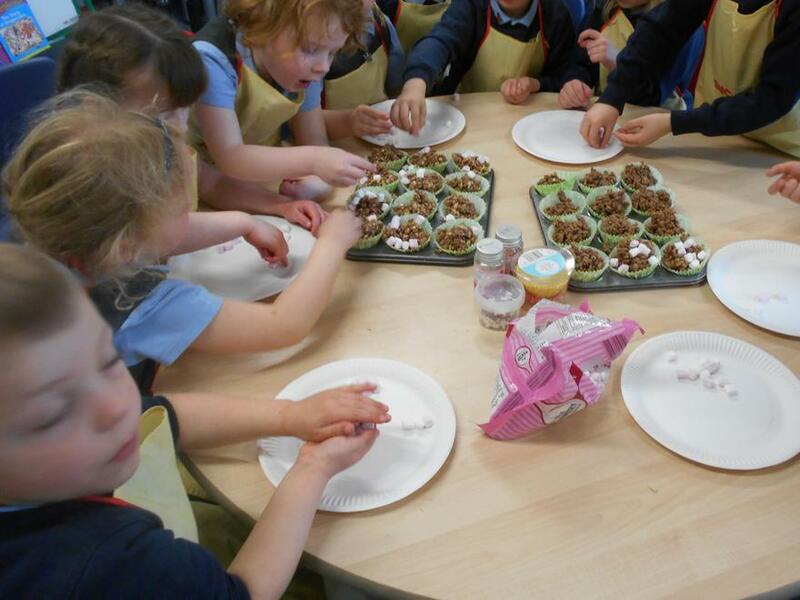 The children were initially exploring the life cycle of cress but this soon turned into something more! 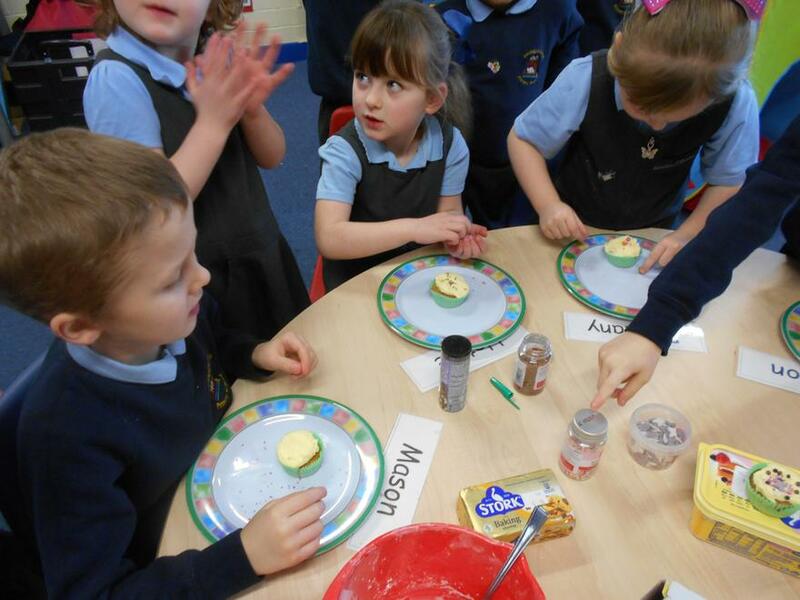 A Royal High Tea affair! 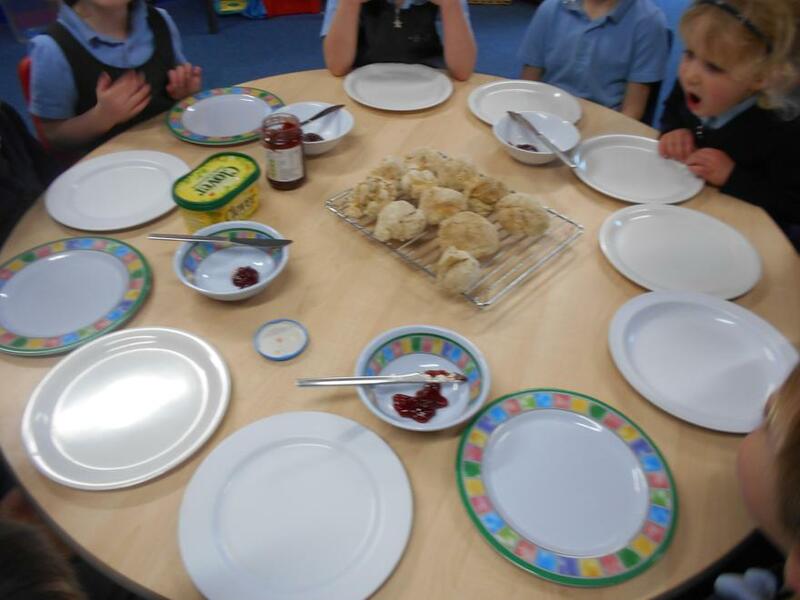 The children wanted to join in with the Royal Wedding celebrations, so they decided they wanted to create a menu of 'Cucumber and Cress' and 'Egg and Cress' sandwiches...with the crust cut off and presented in triangles! 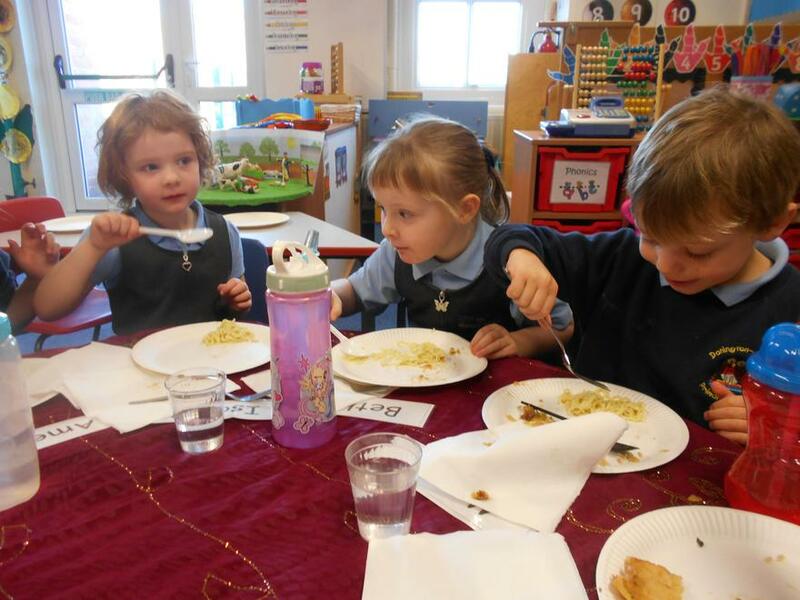 They were all very vocal and loved their class gathering. 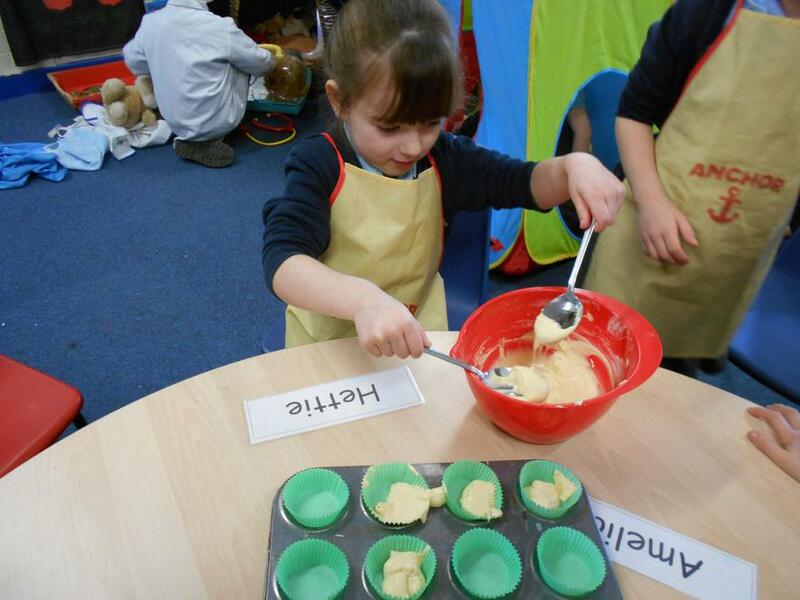 What a great start to the new term! 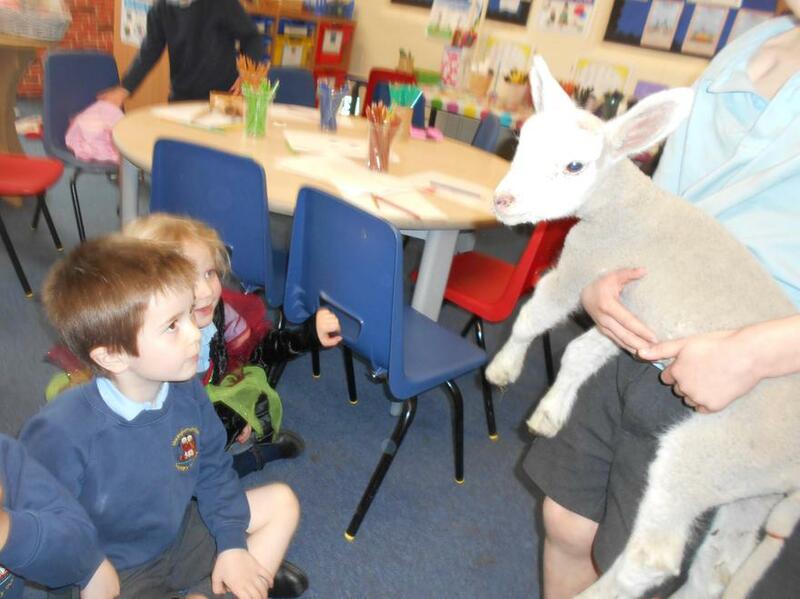 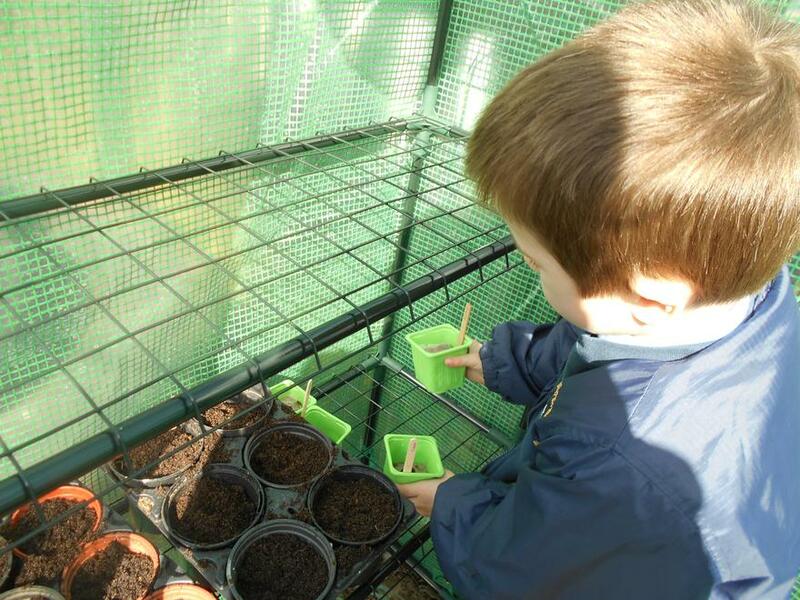 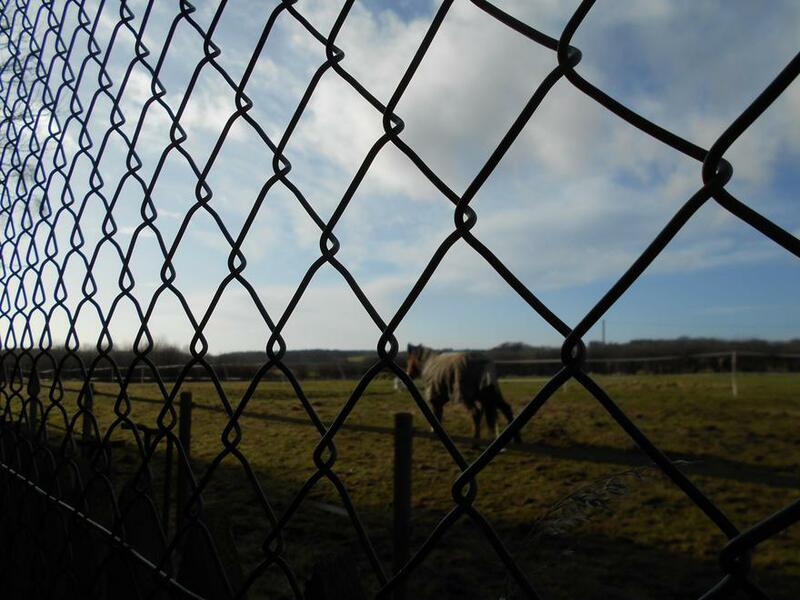 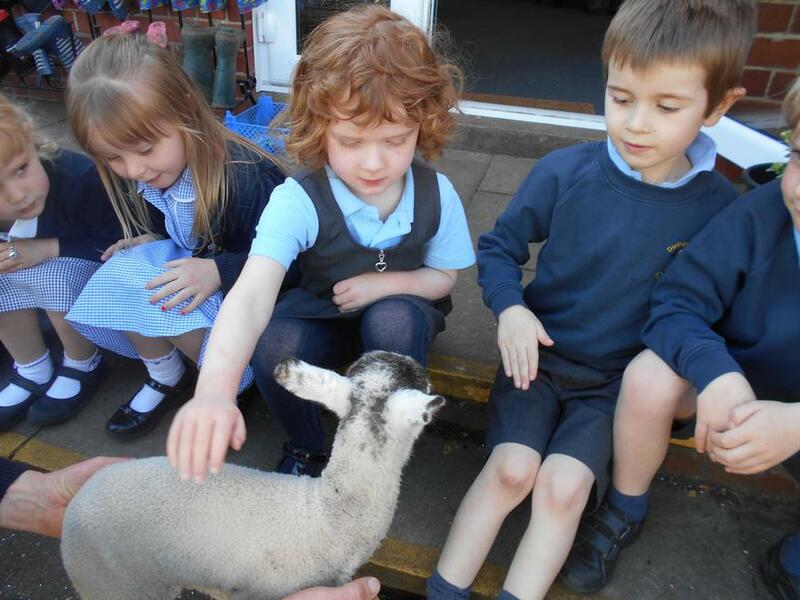 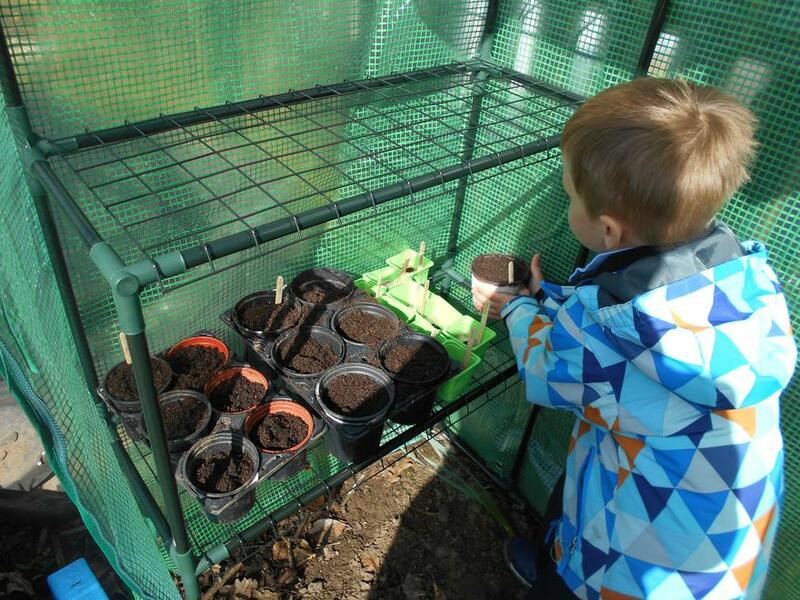 The children have enjoyed the visiting lambs, embraced child initiated time, investigated living things: planting seeds and explored Shape, Space and Measure activities. 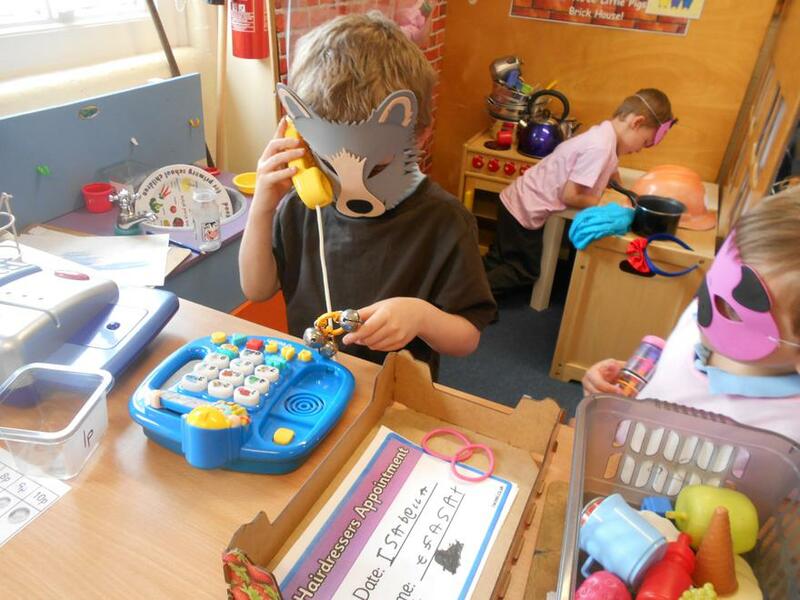 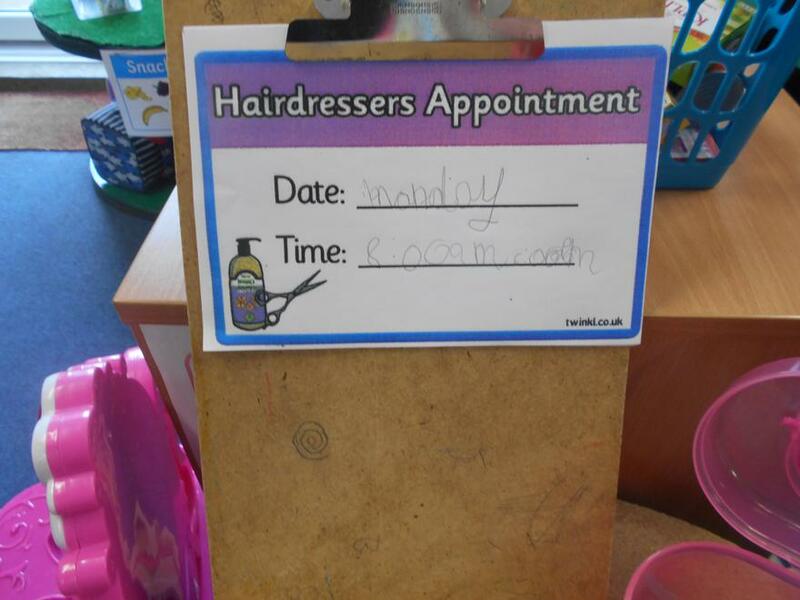 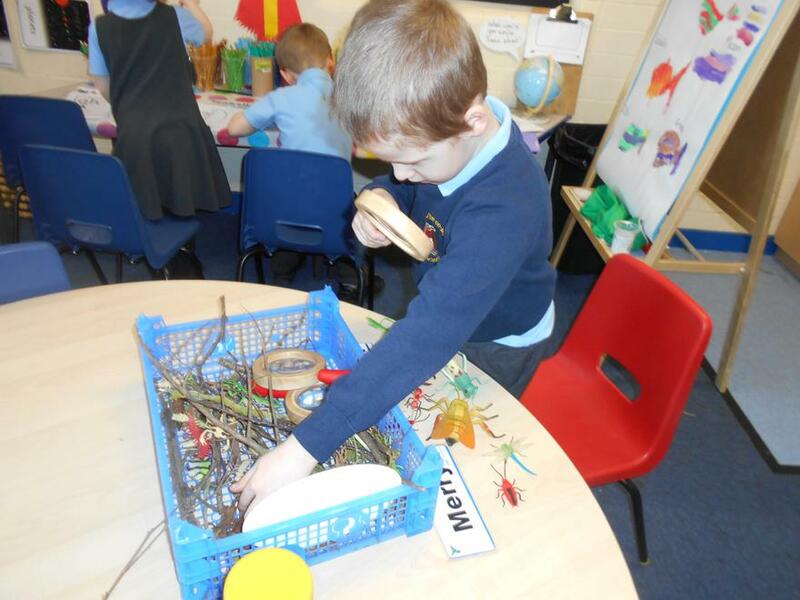 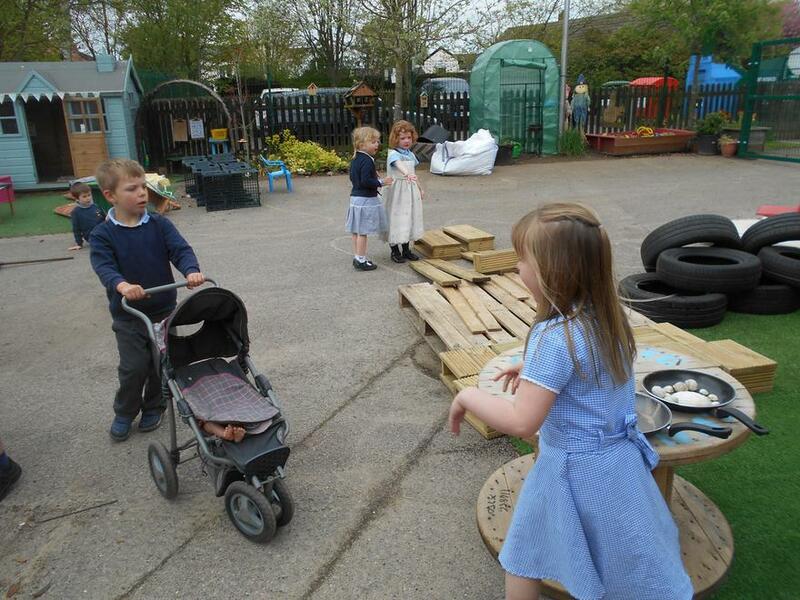 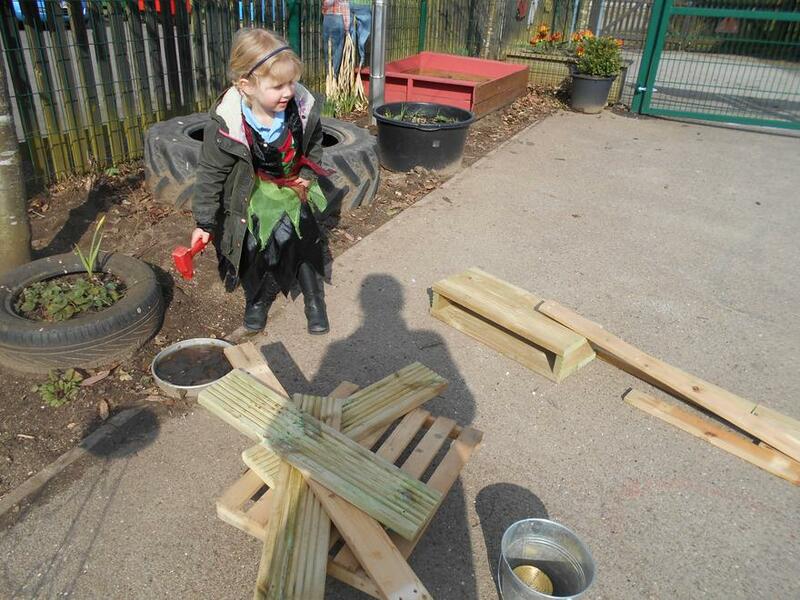 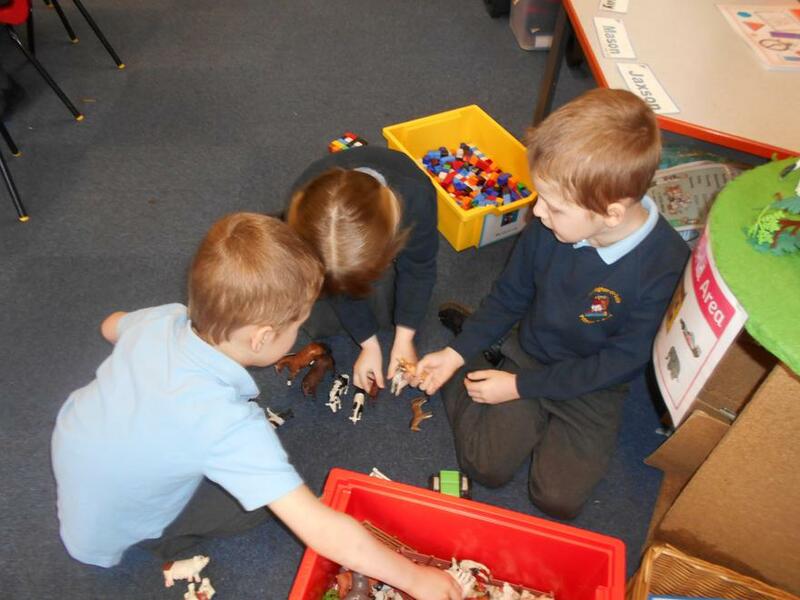 This week the children have been extremely busy in their play! 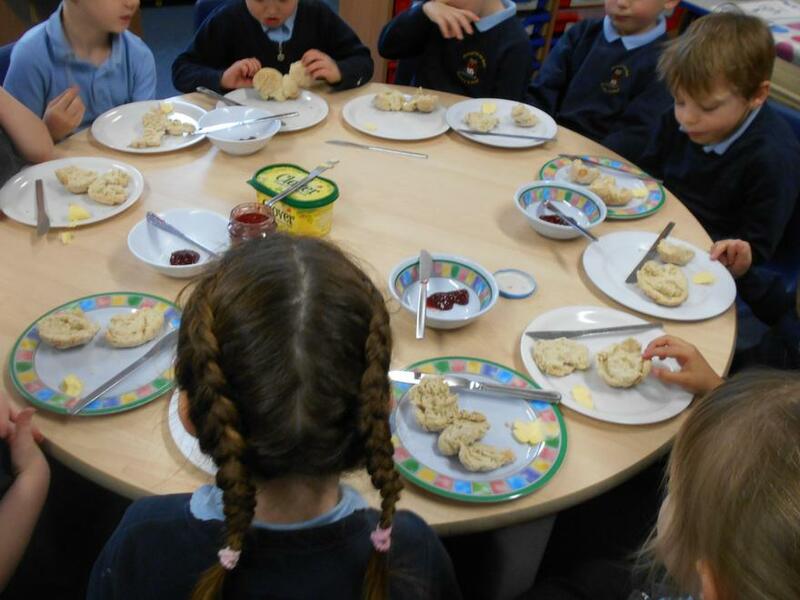 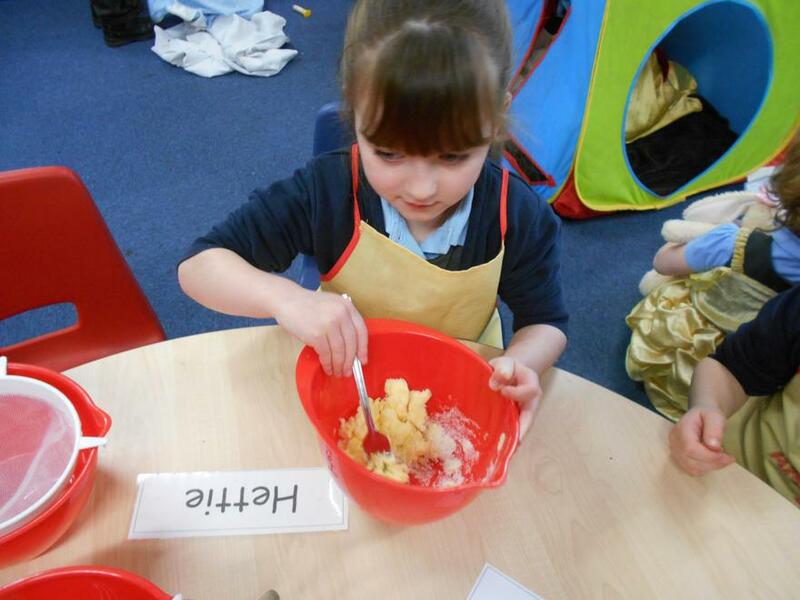 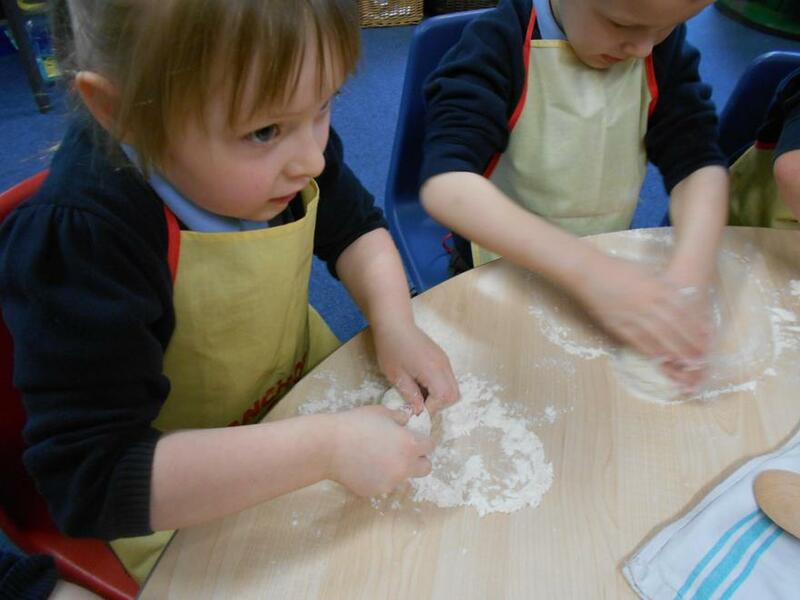 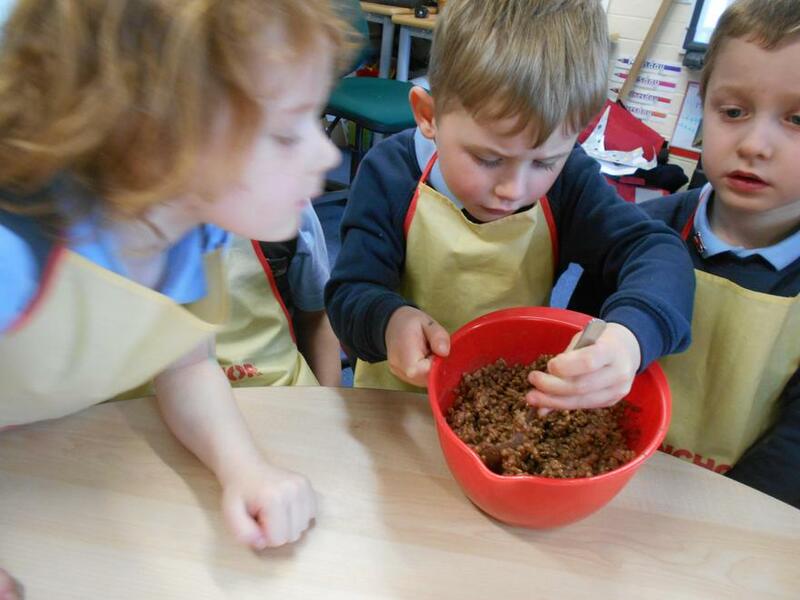 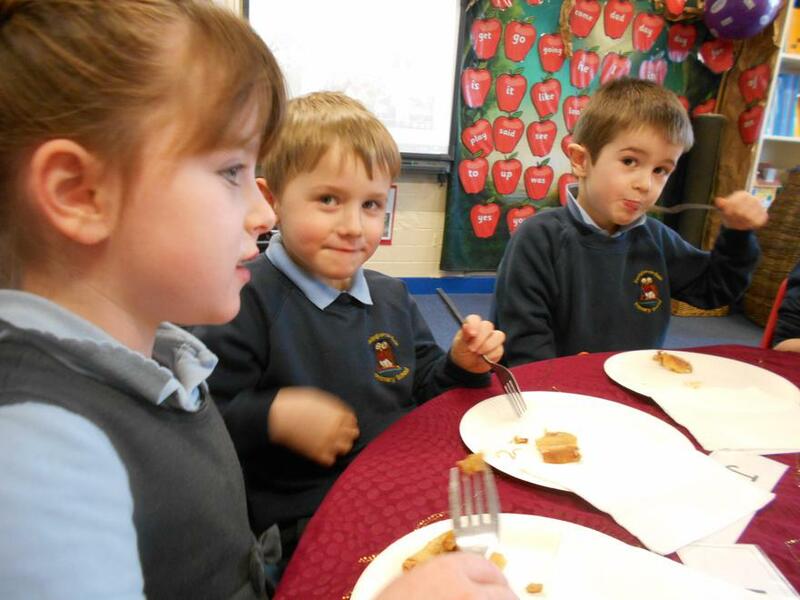 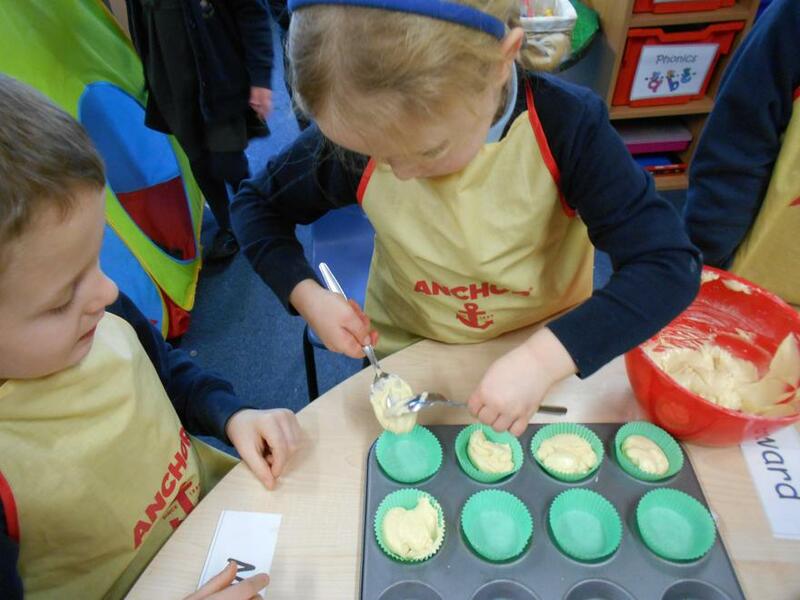 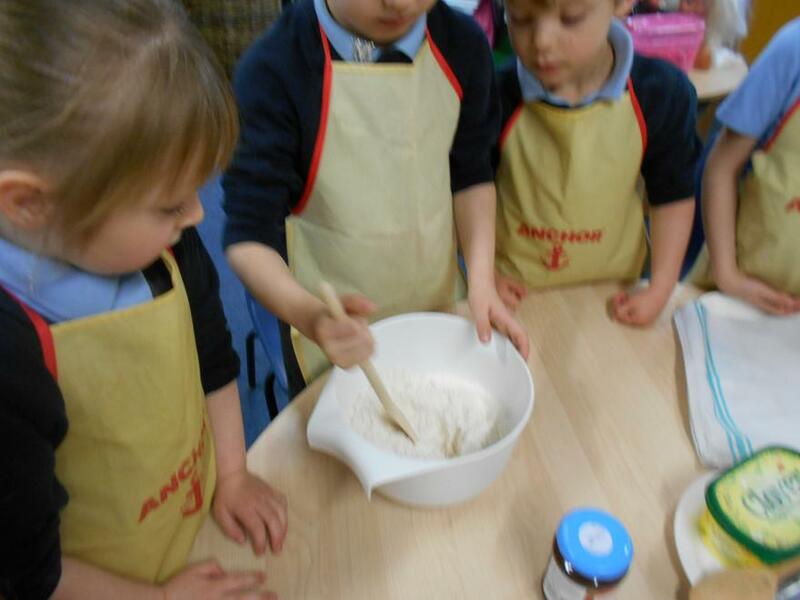 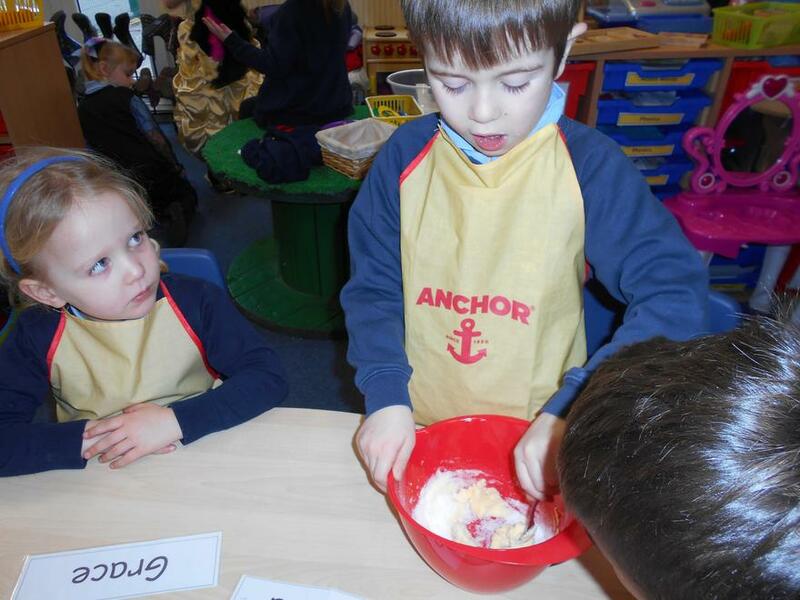 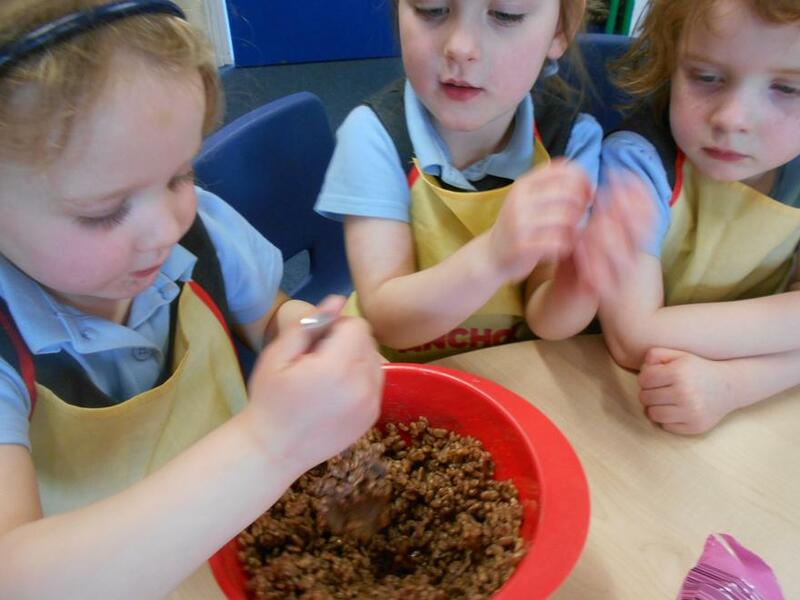 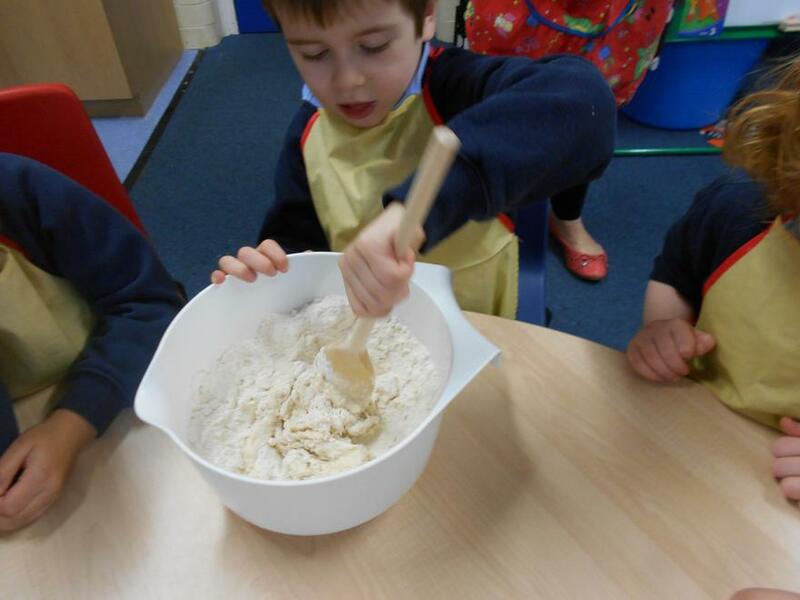 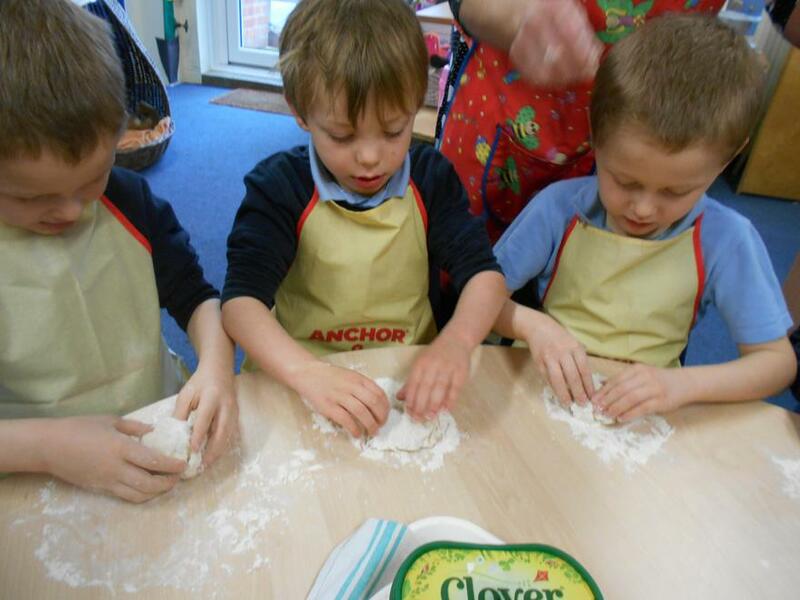 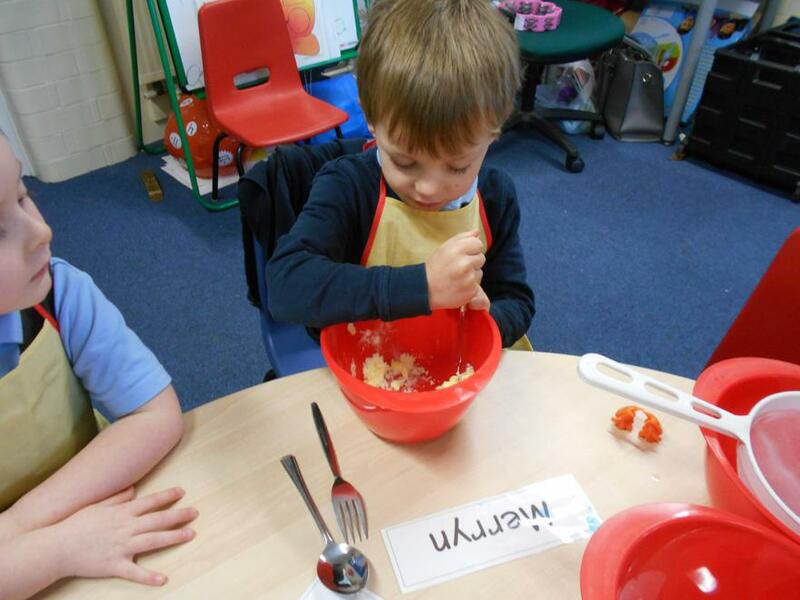 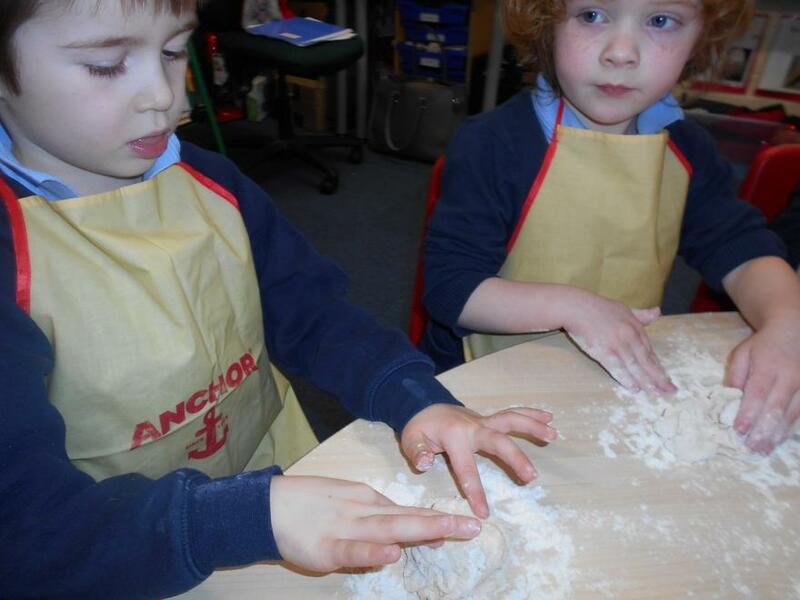 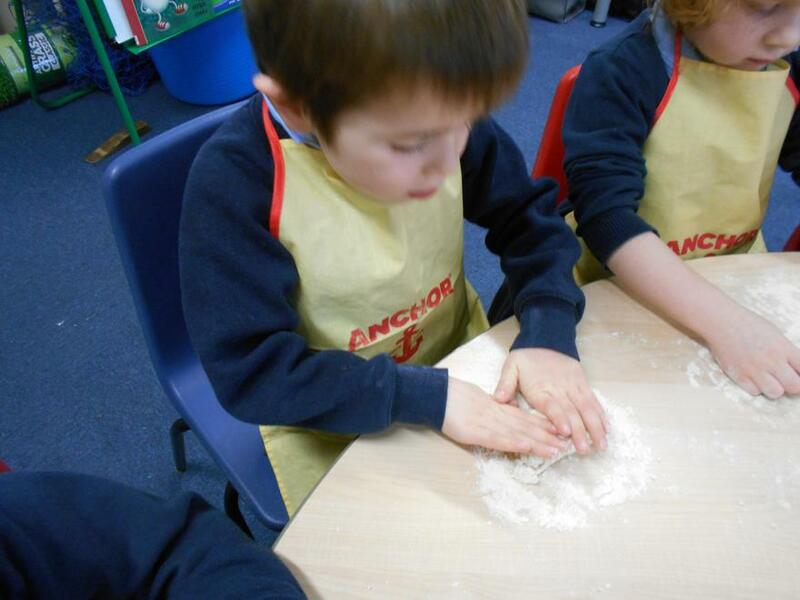 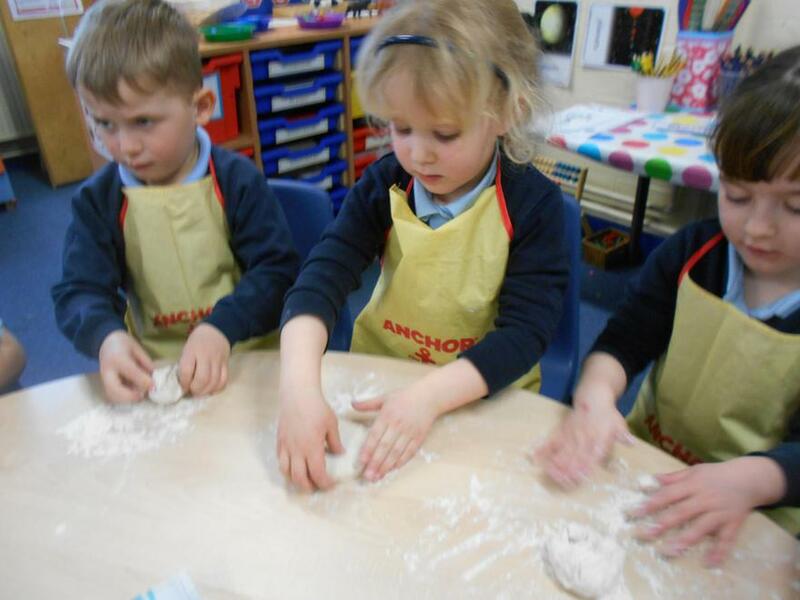 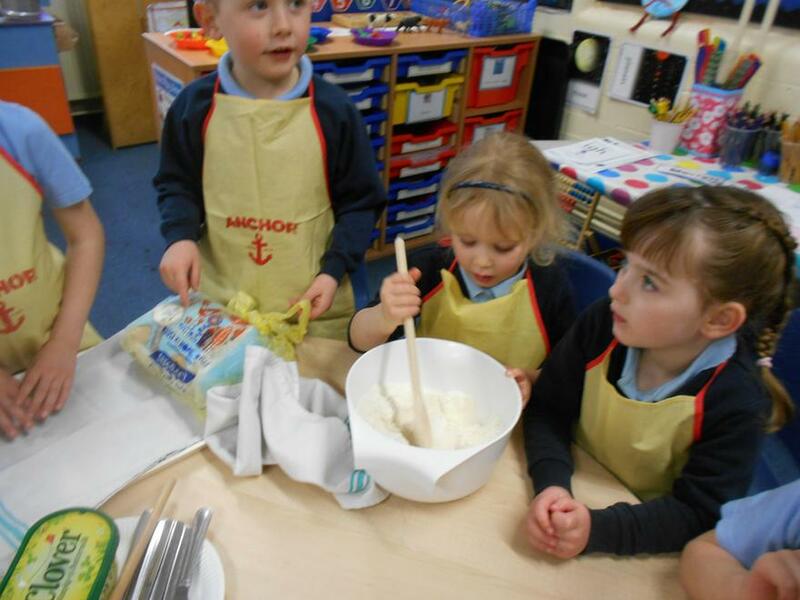 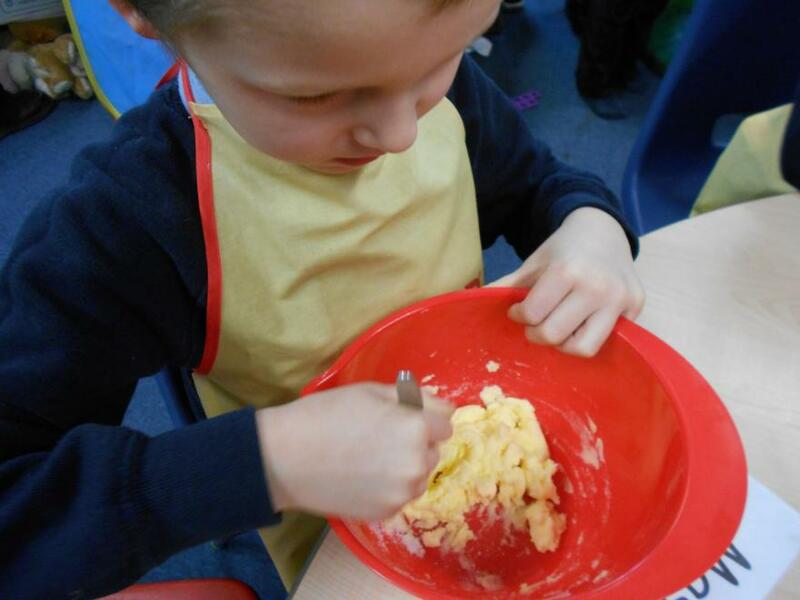 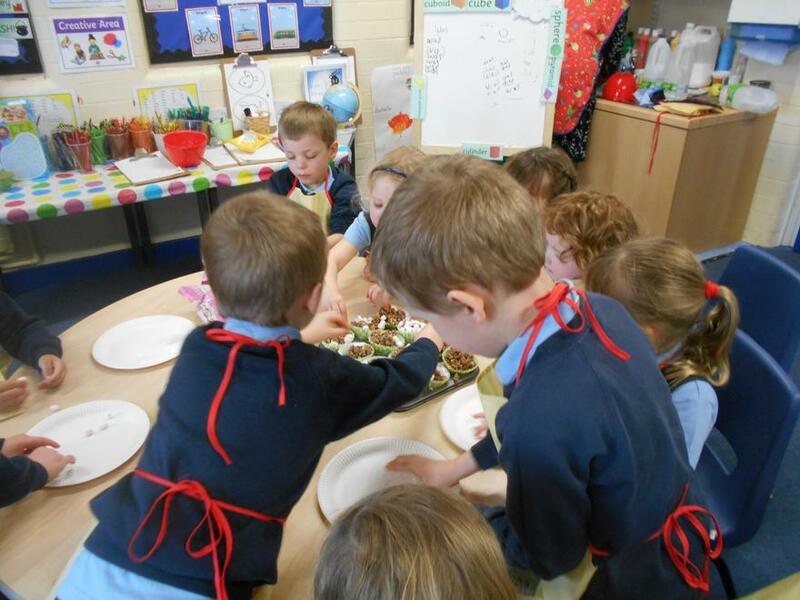 They have especially enjoyed Goldilocks' Porridge making and tasting! 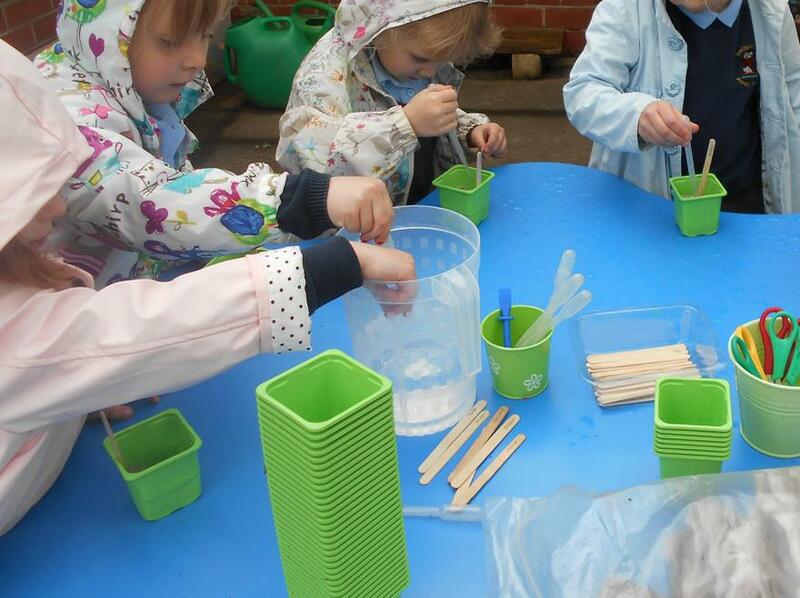 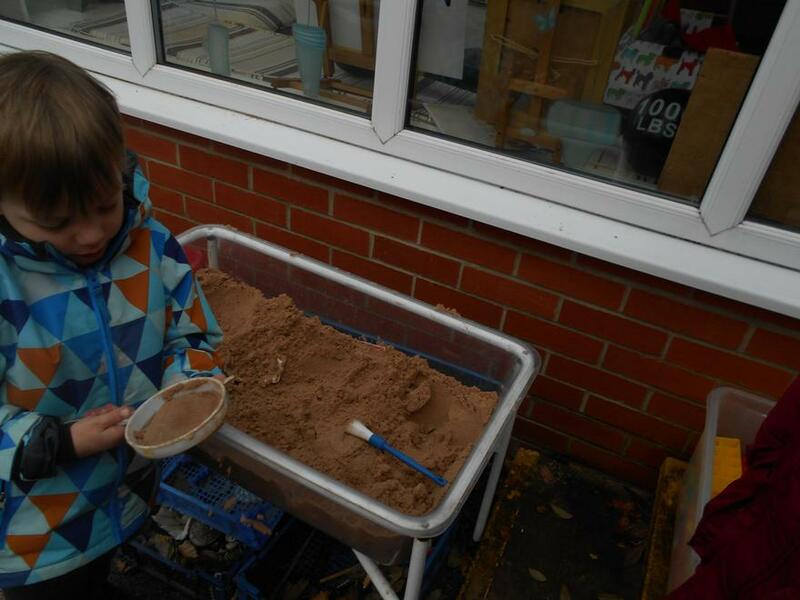 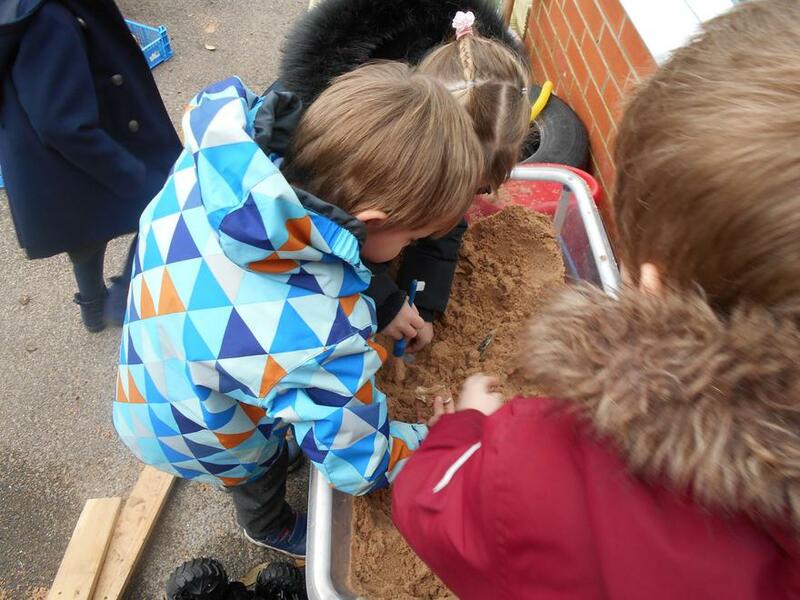 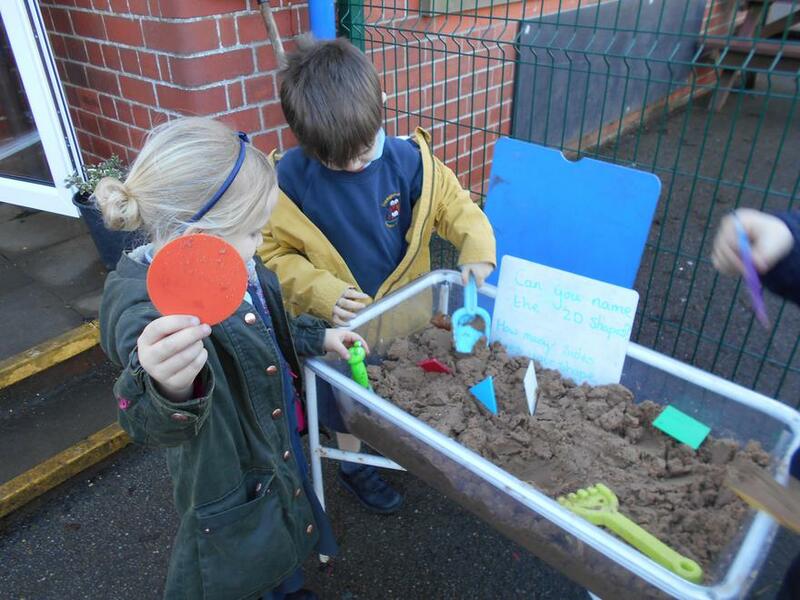 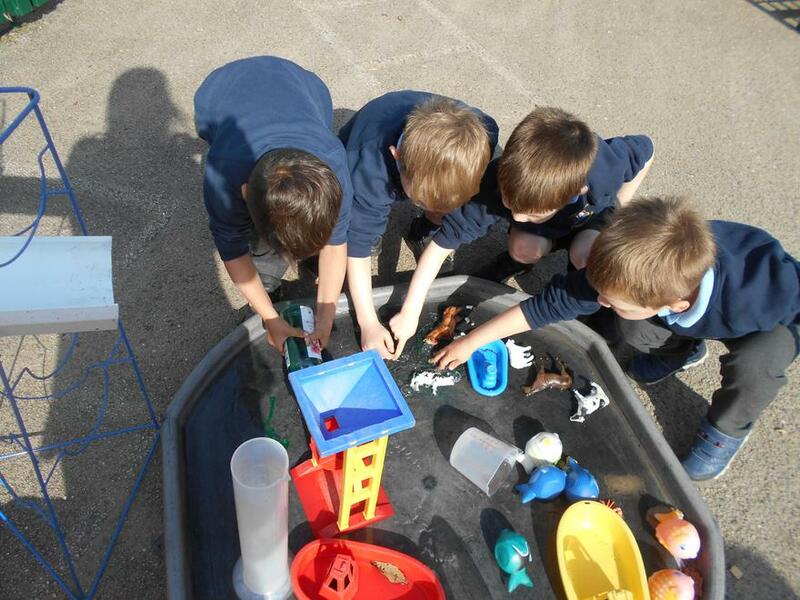 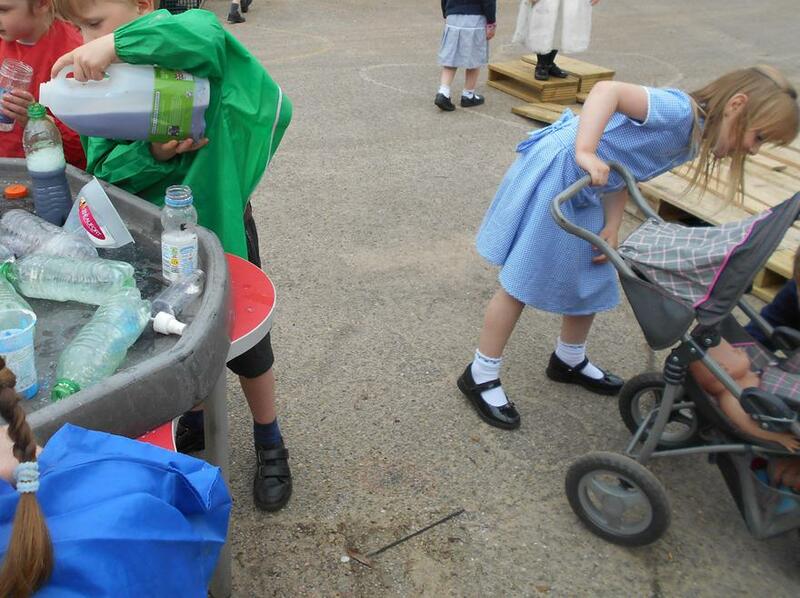 This afternoon the children have loved playing in the sand, making potions and exploring some new equipment. 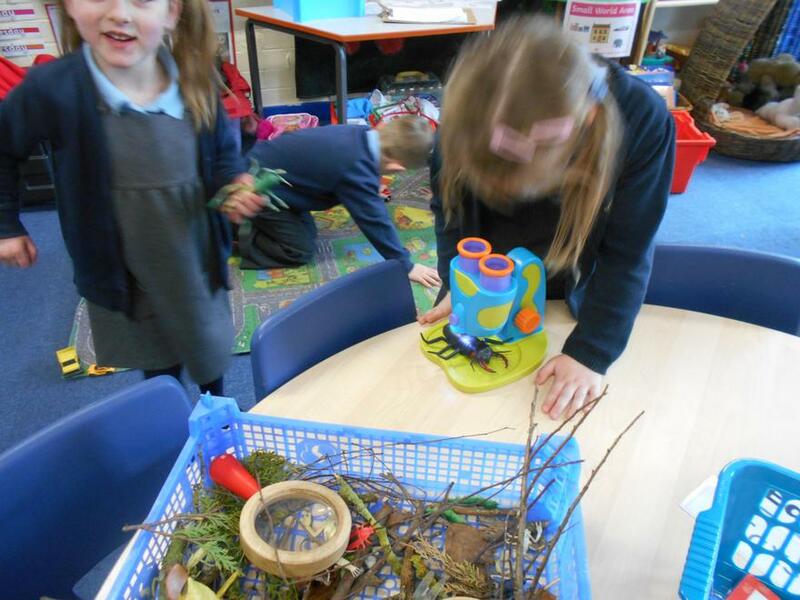 their environment, new concepts and their imaginations! 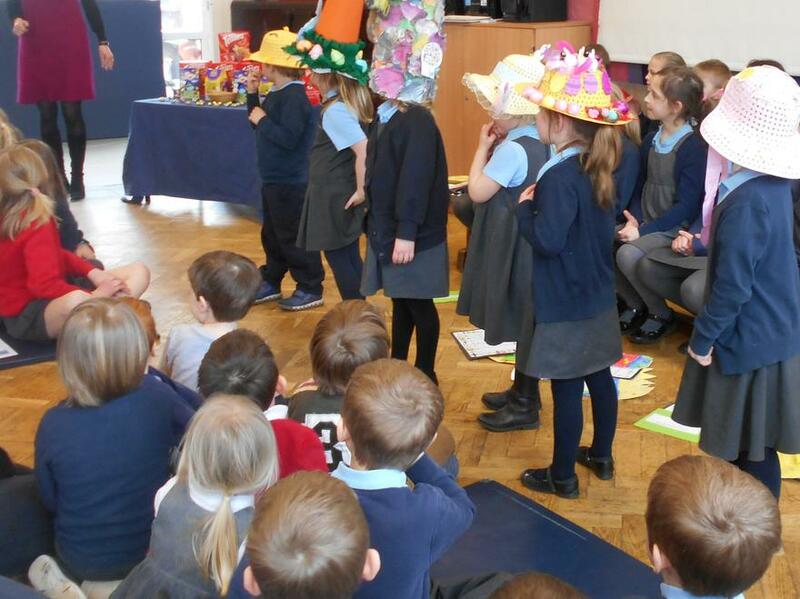 Today the children took part in the World Book Day celebrations. 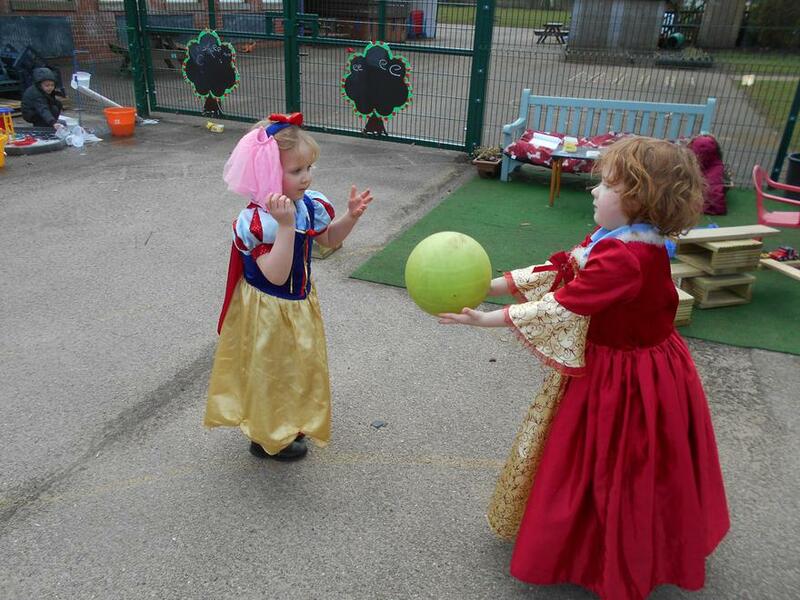 The children’s costumes were amazing! 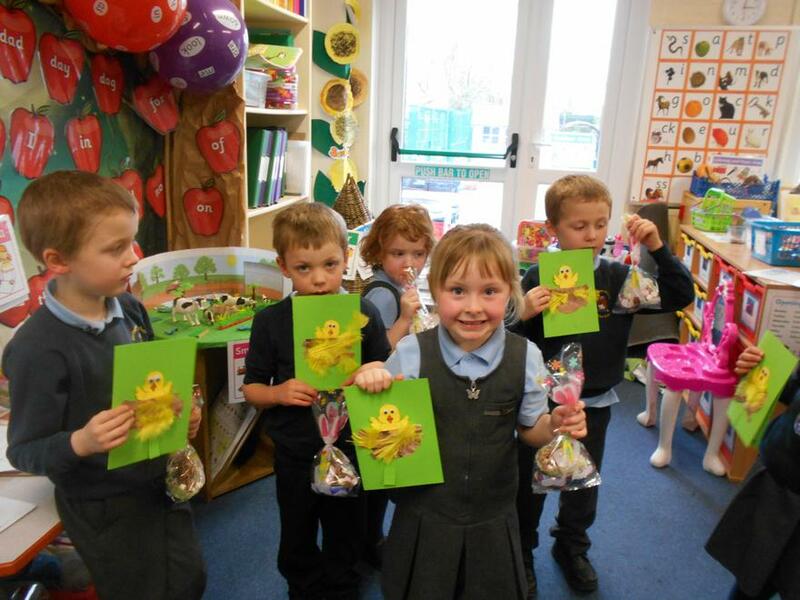 The children have thoroughly enjoyed and embraced all aspects of the Easter preparations. 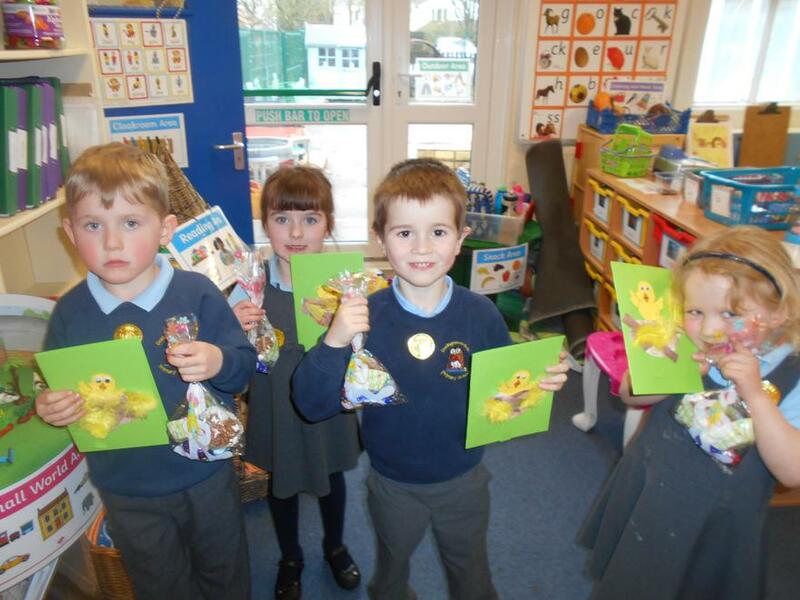 This included learning about the meaning of Easter, creating Easter Cards, making Easter treats, tasting hot cross buns to taking part in the Easter assembly and the Easter bonnet parade. 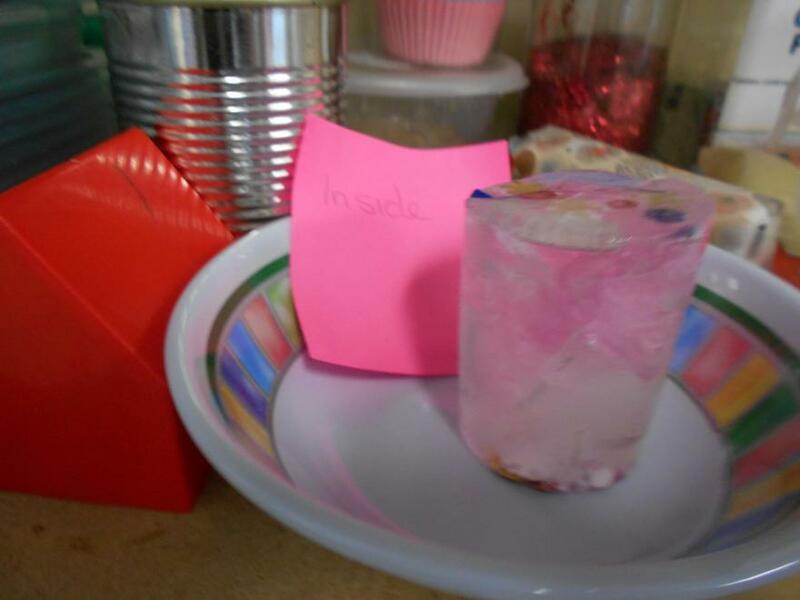 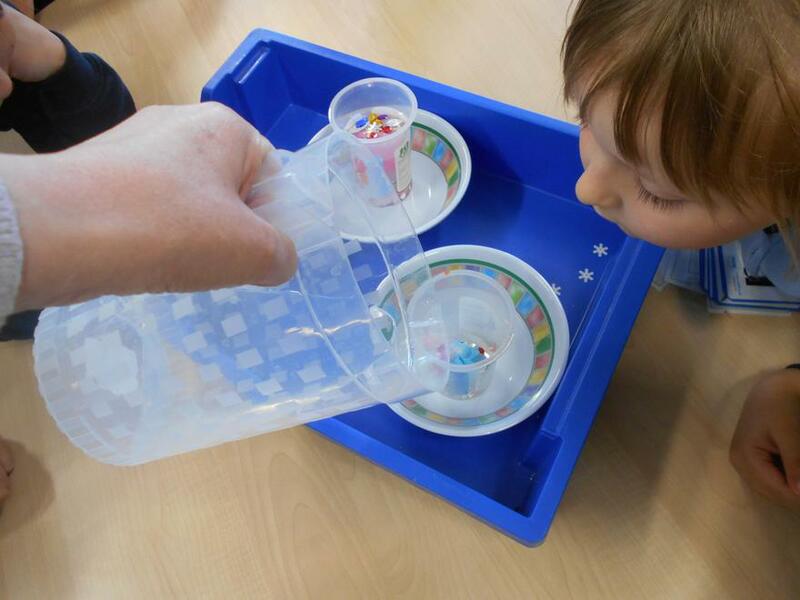 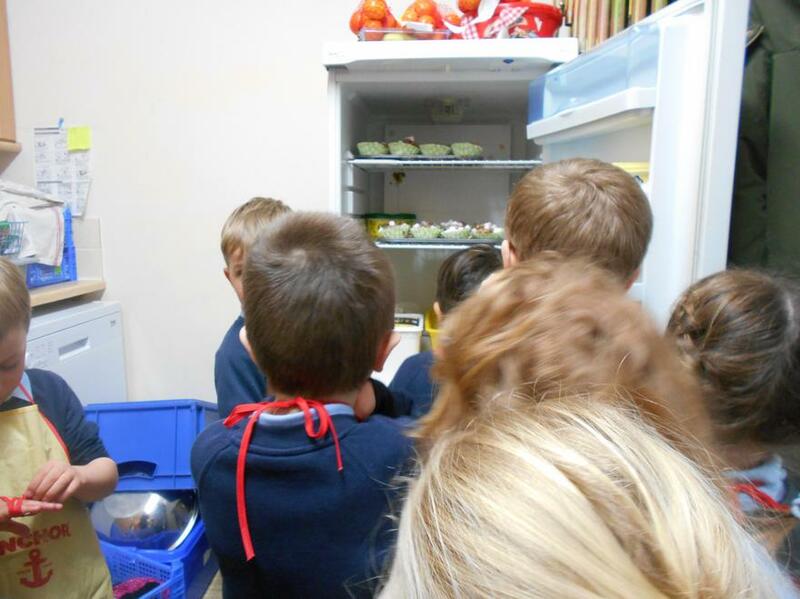 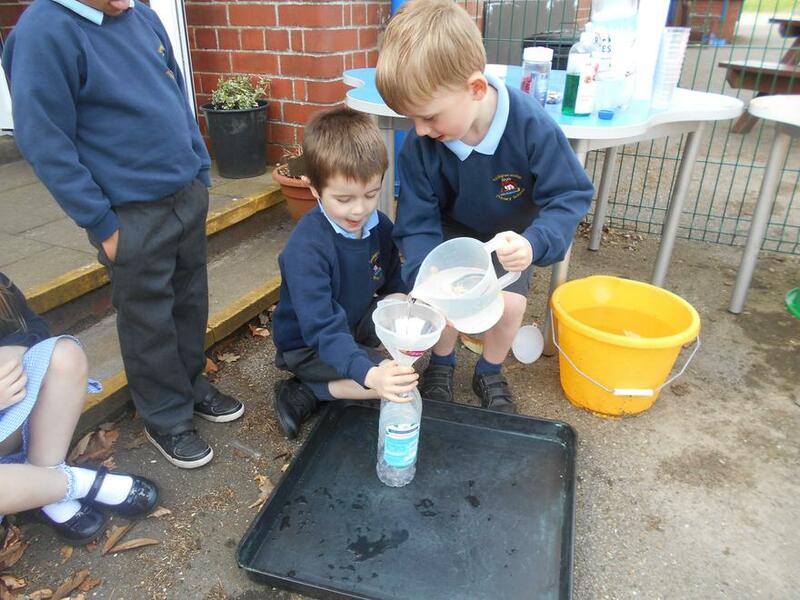 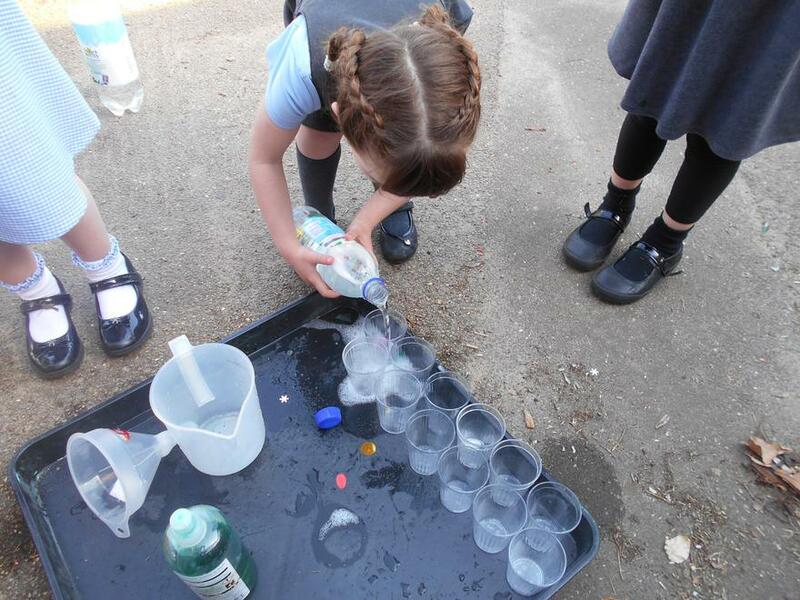 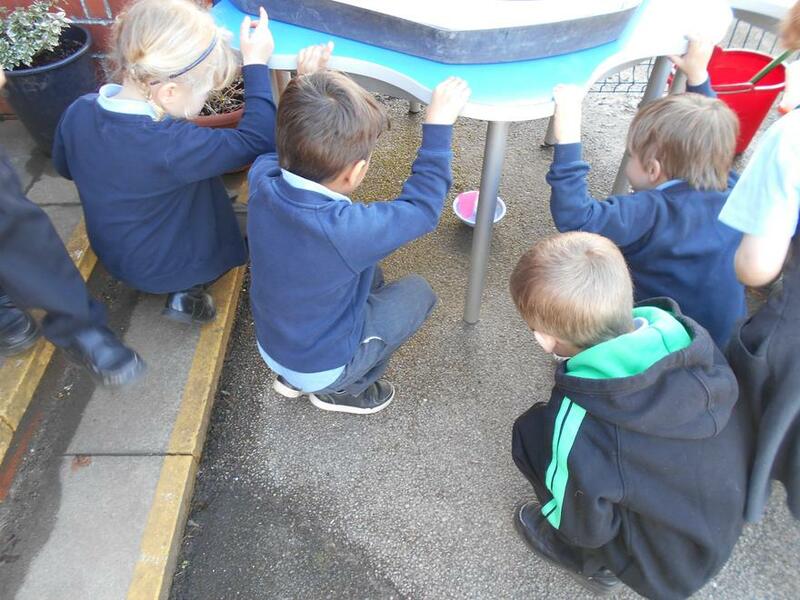 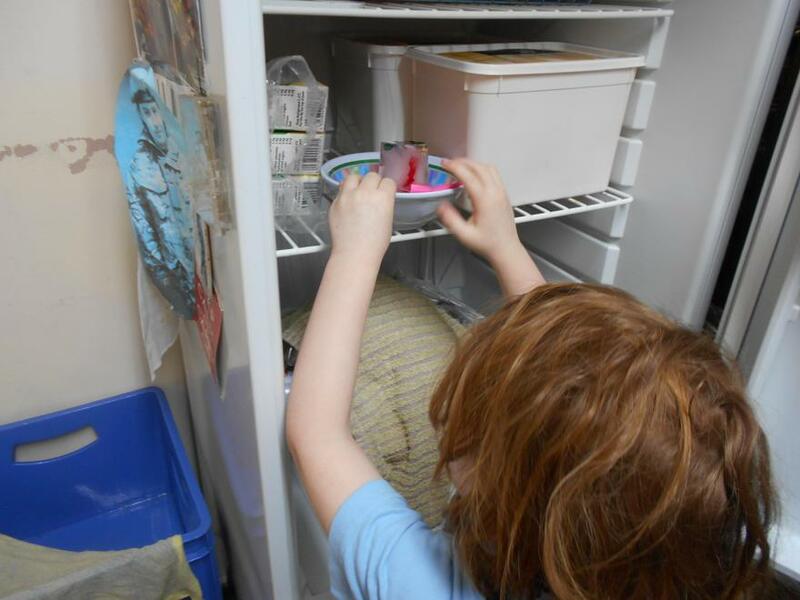 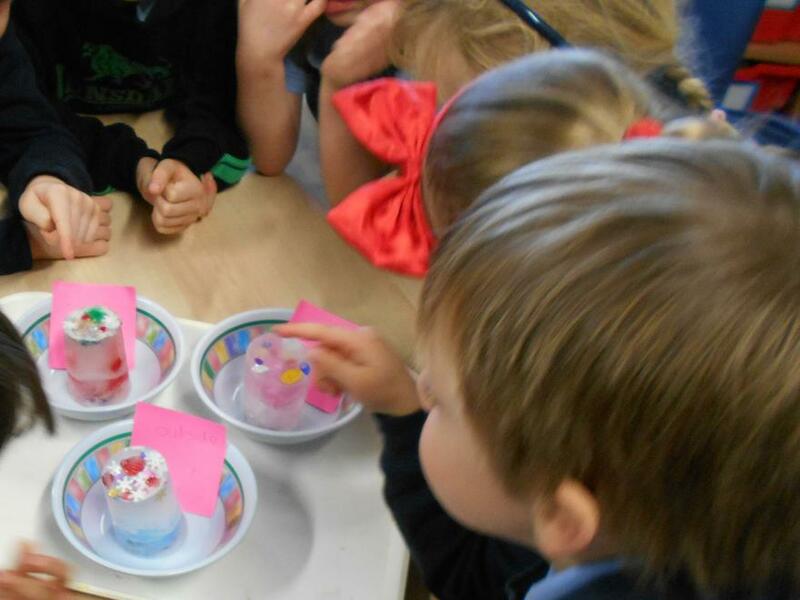 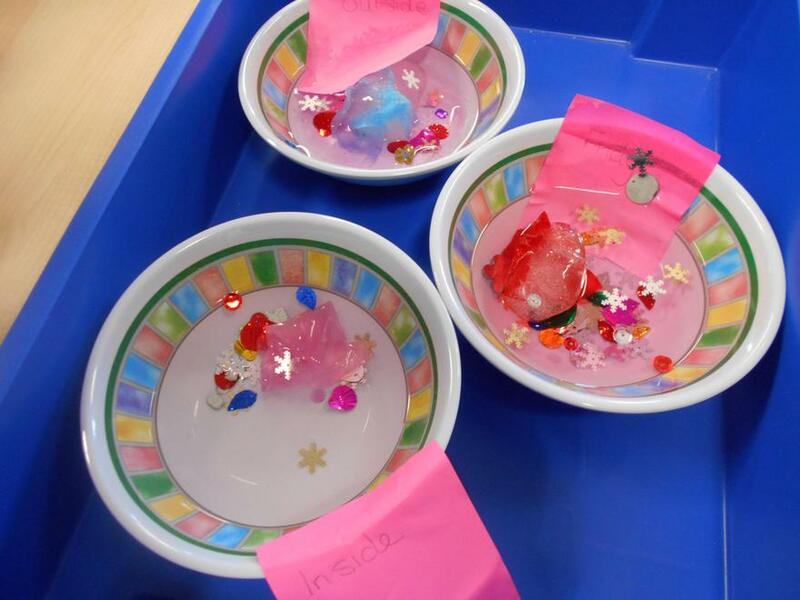 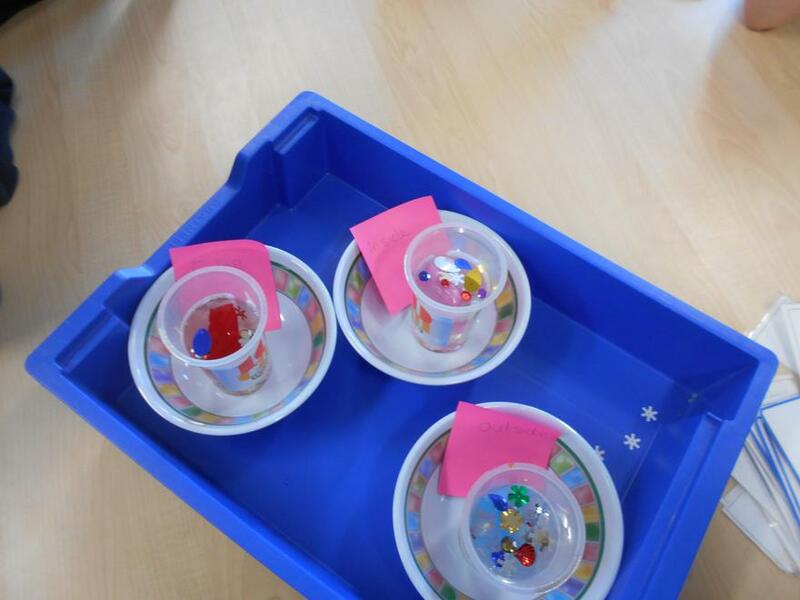 During our Science week, the children were very intrigued to investigate which area would melt their ‘Ice sparkly potions’ the quickest (inside, outside or in the fridge). 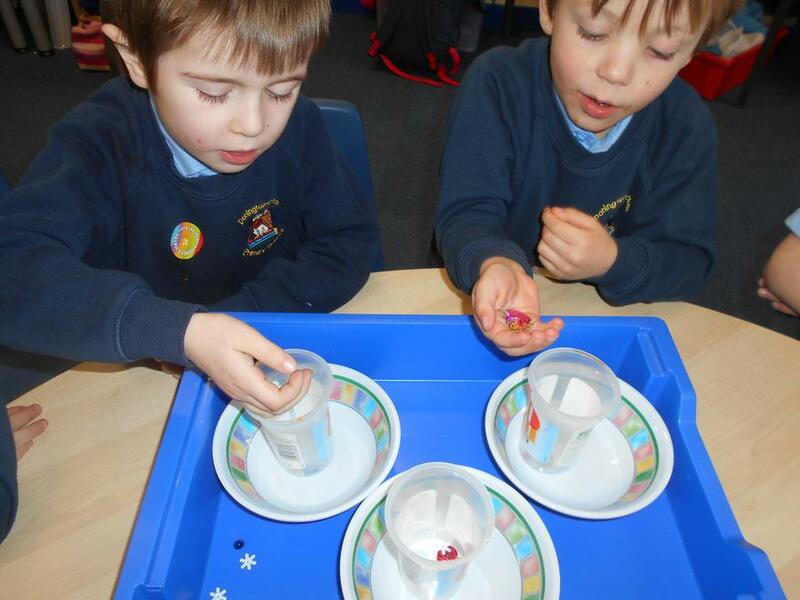 They were very methodical in preparing their ice potions, predicting and analysing their results. 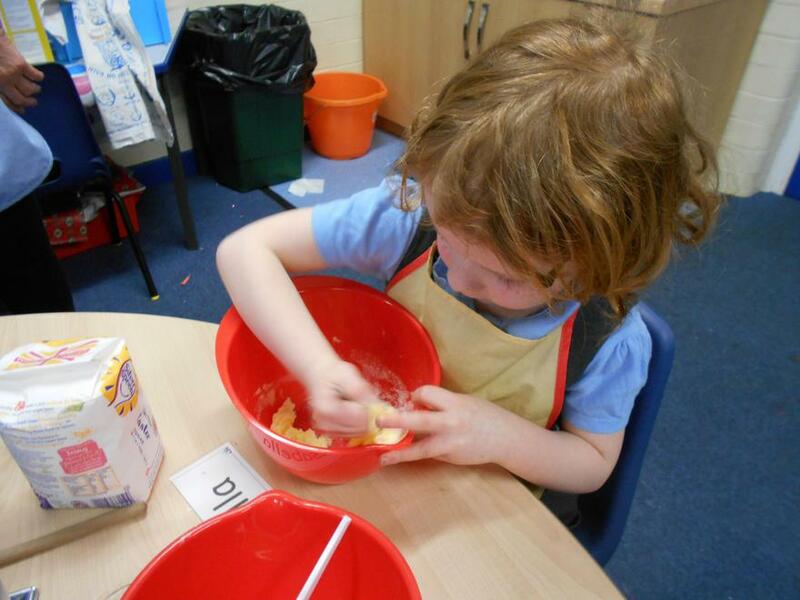 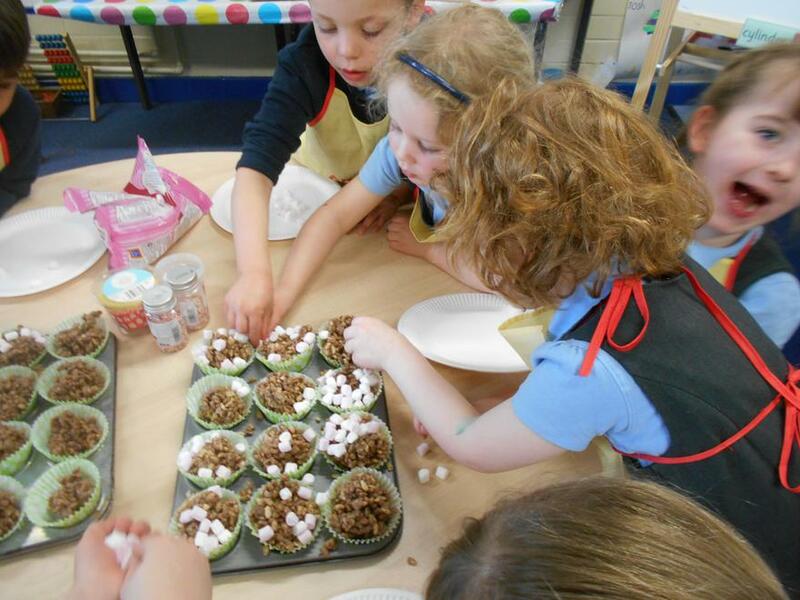 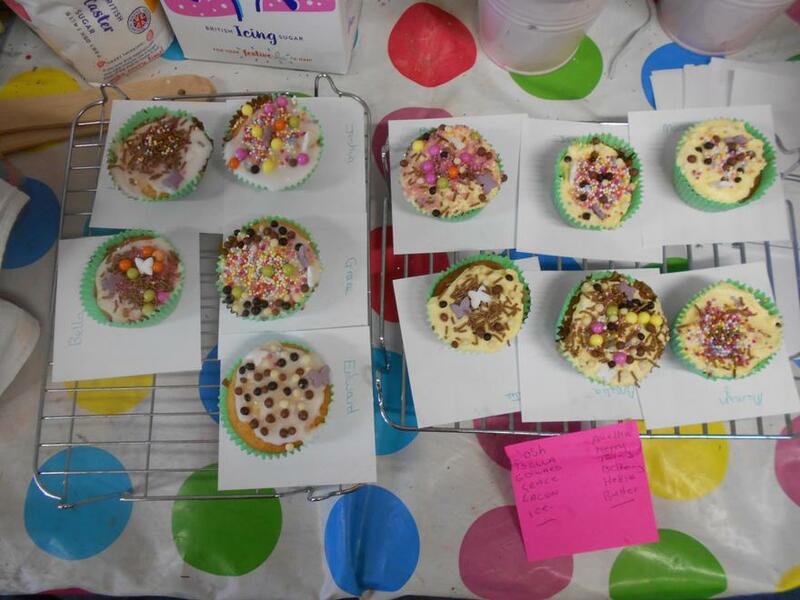 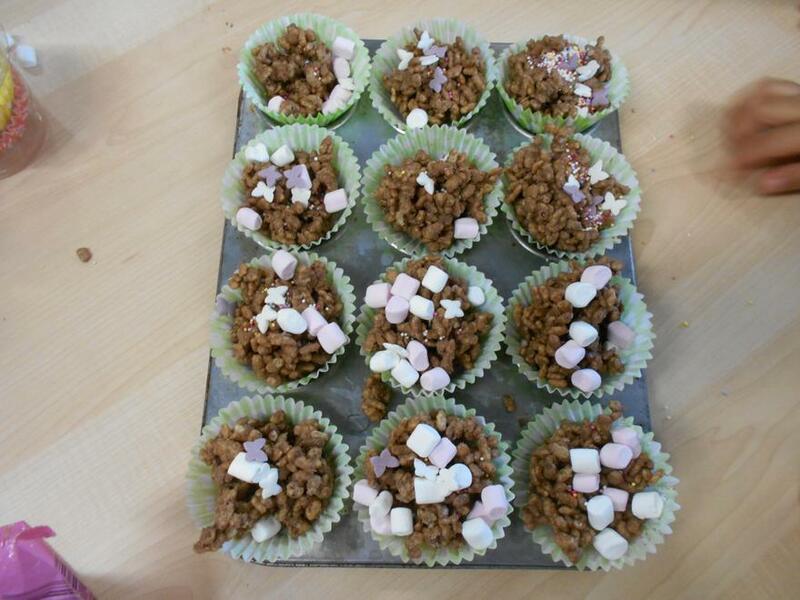 The children’s baking skills are coming on a treat! 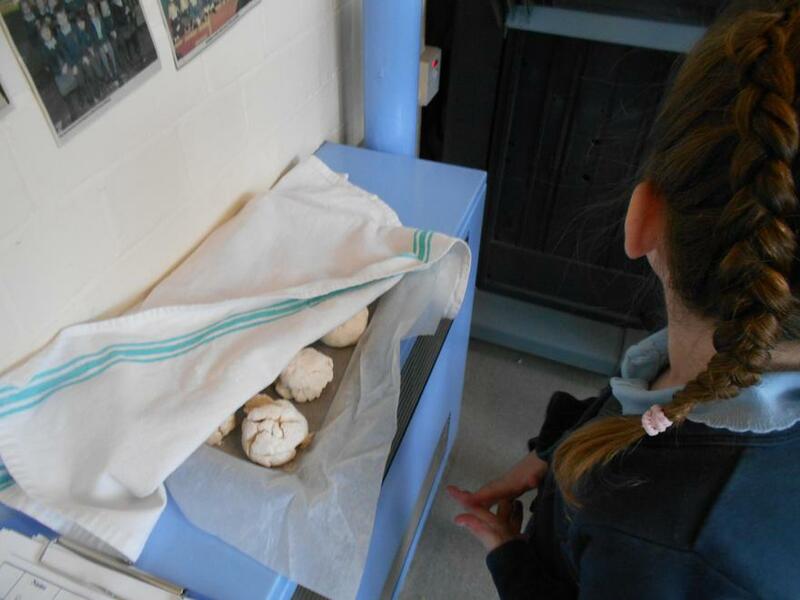 There were lots of discussions about why the bread buns rose. 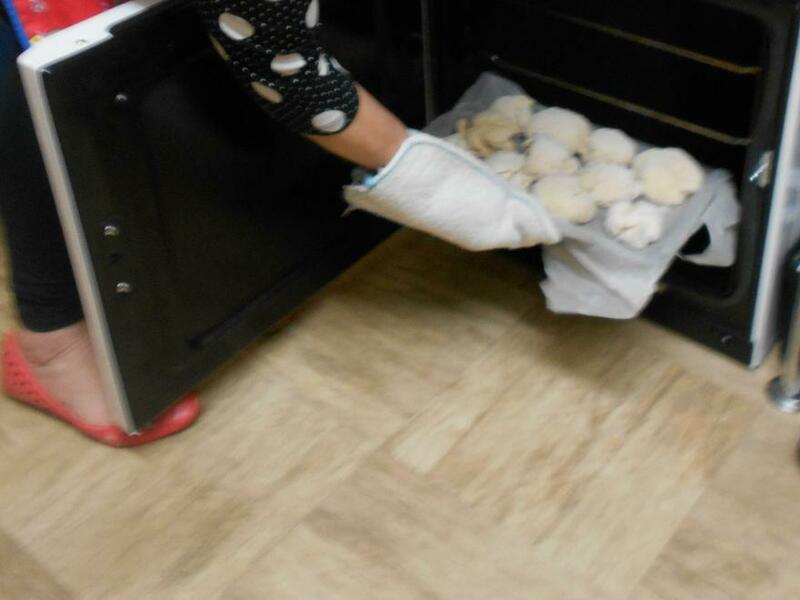 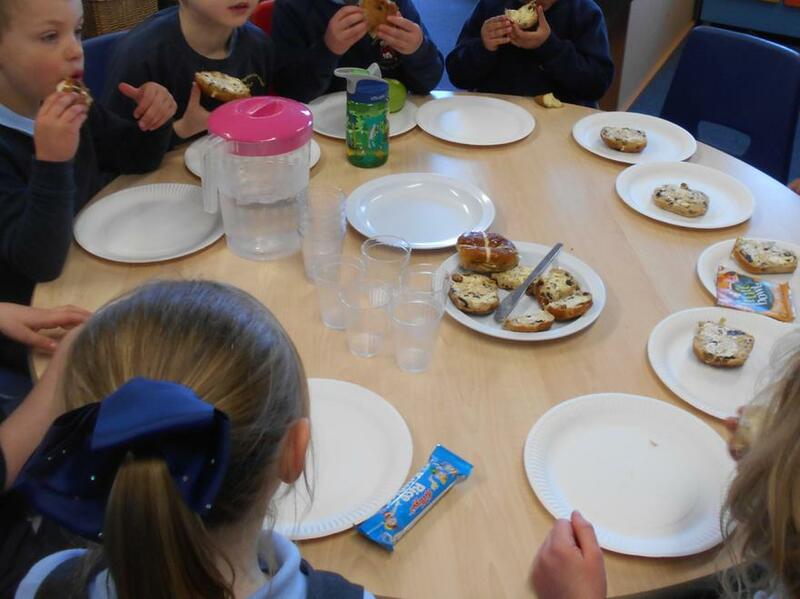 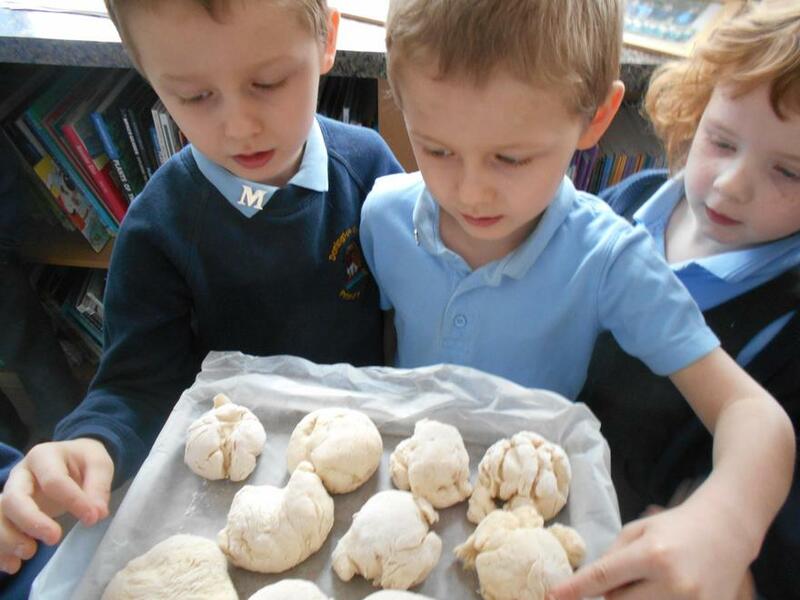 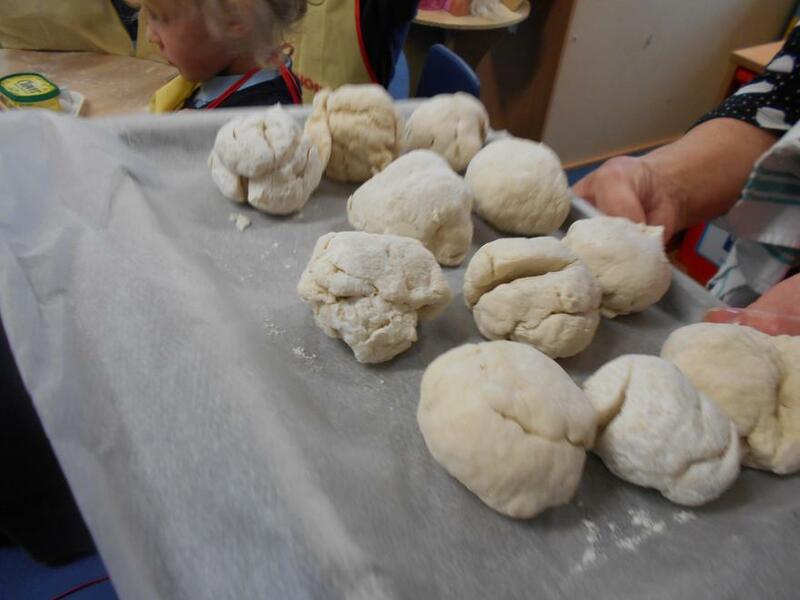 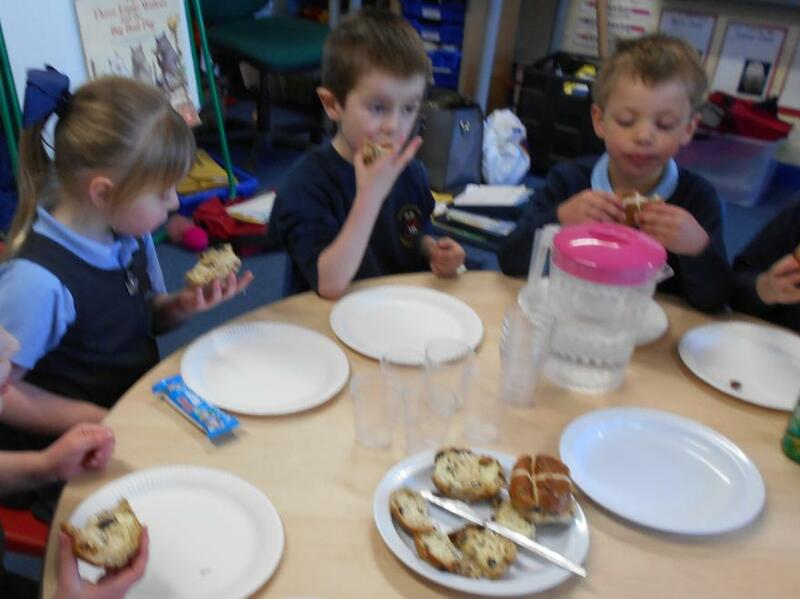 They also loved tasting their baked bread buns after they had cooled! 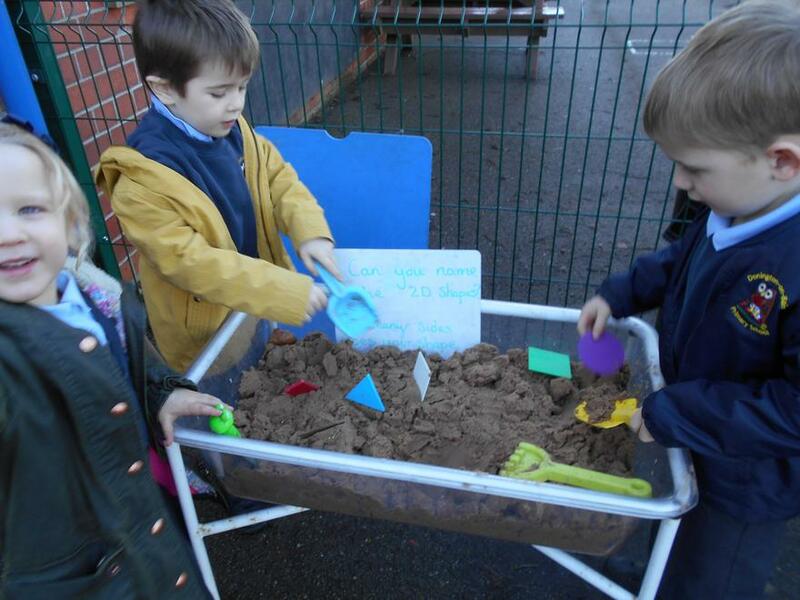 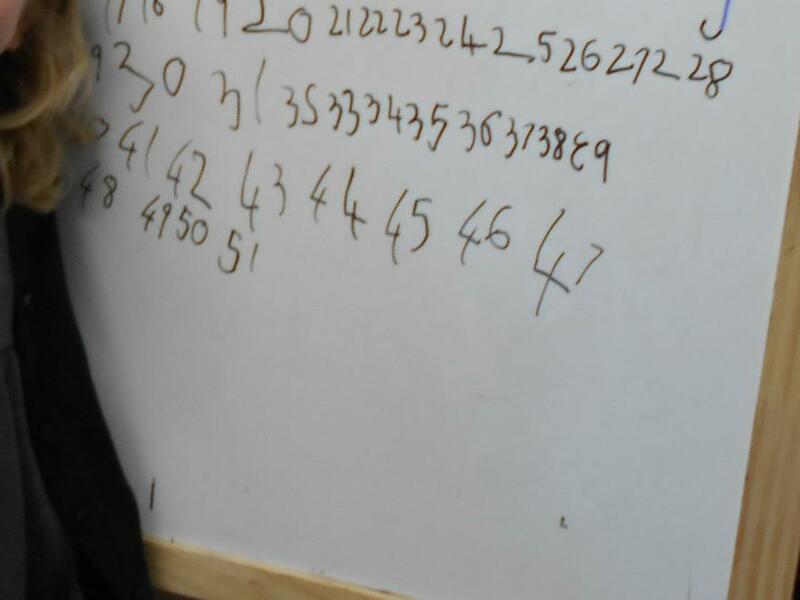 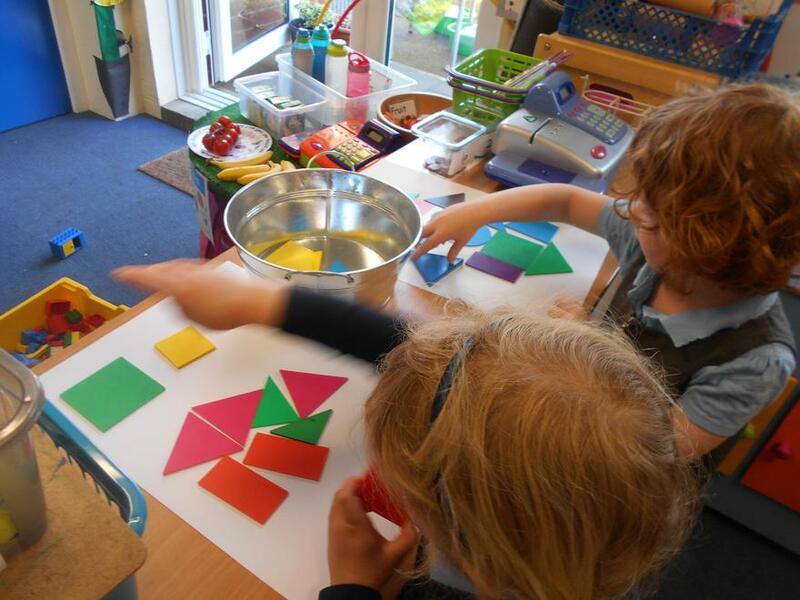 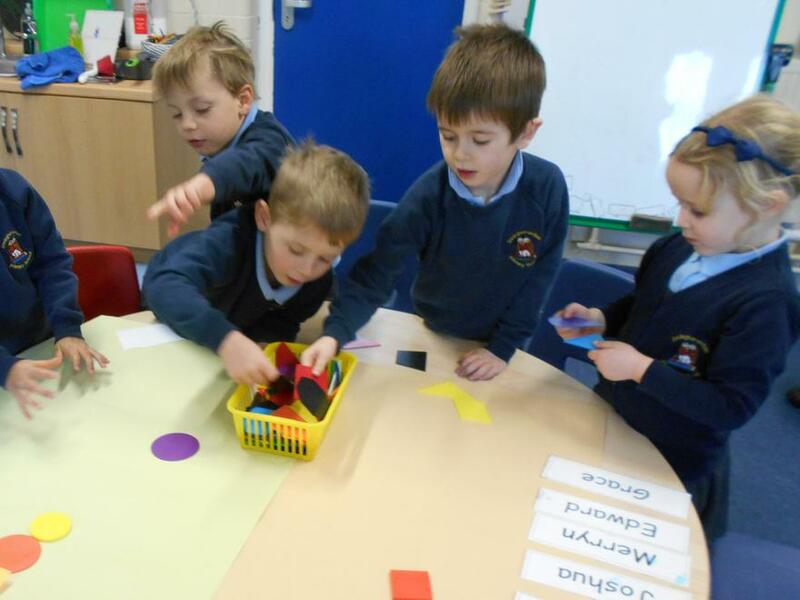 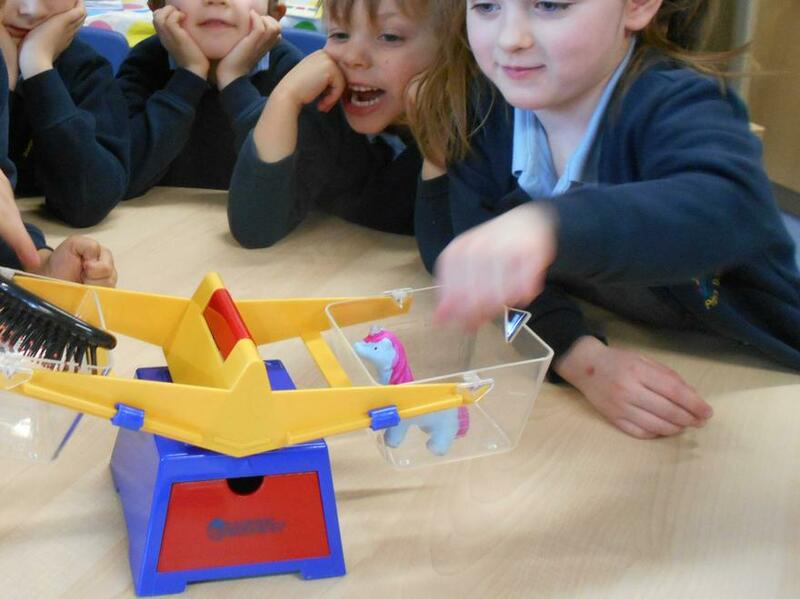 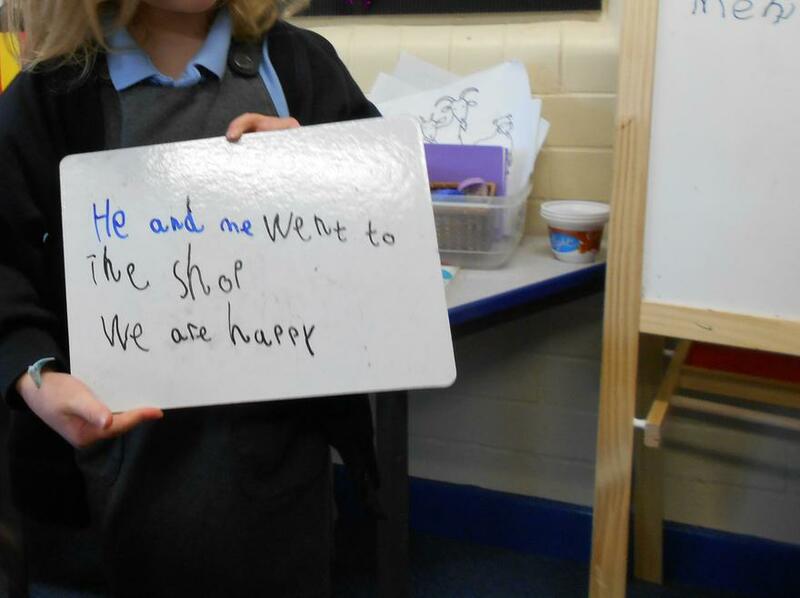 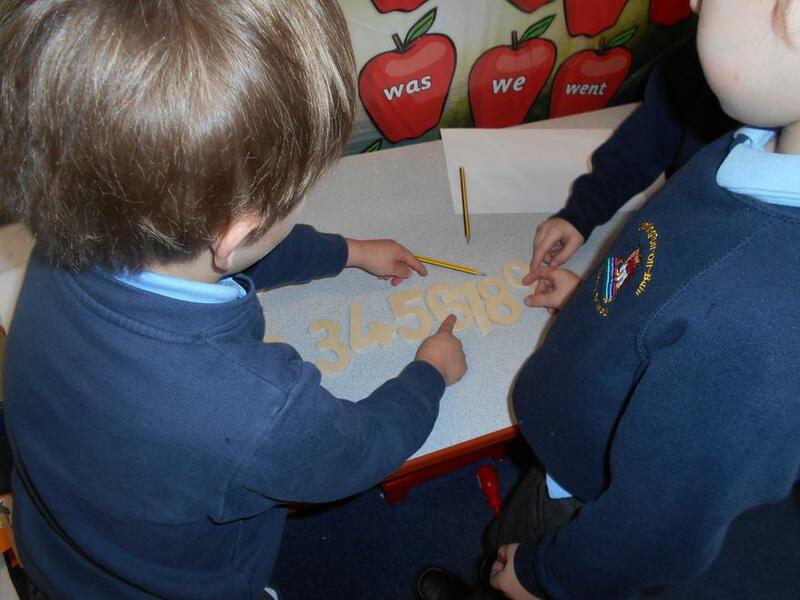 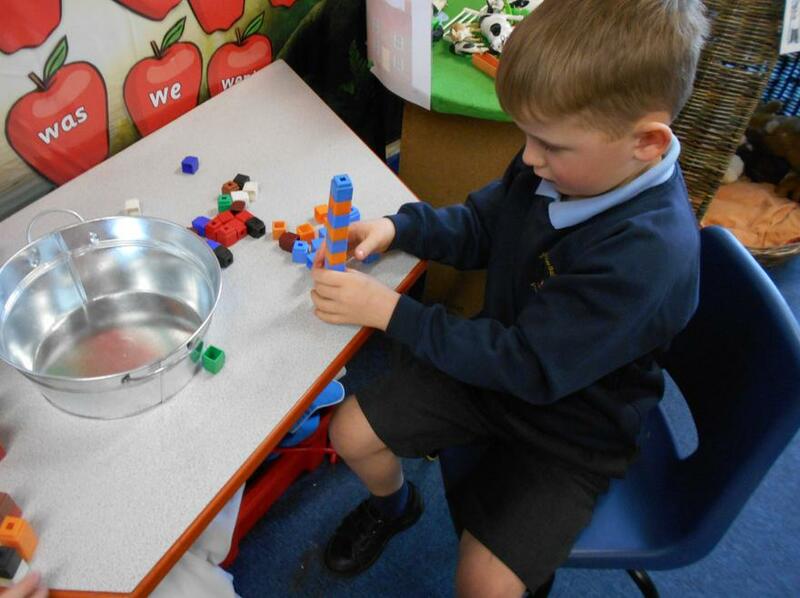 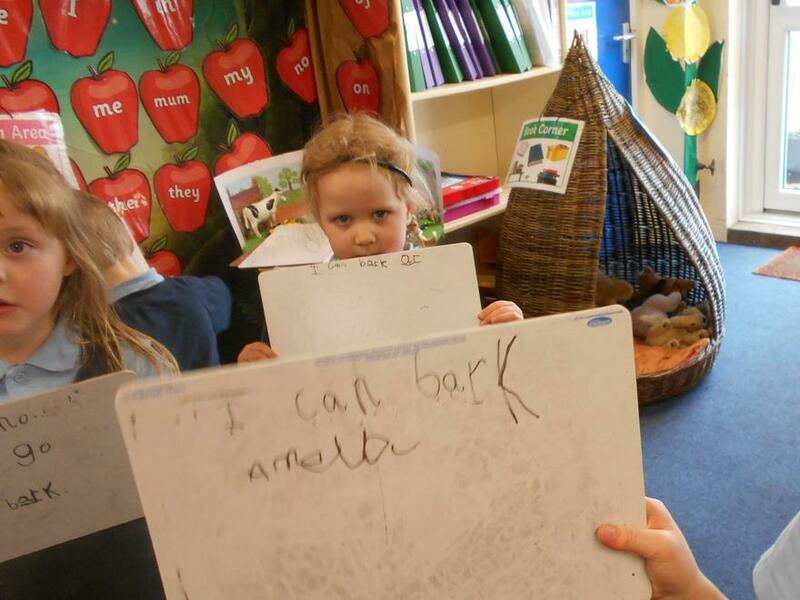 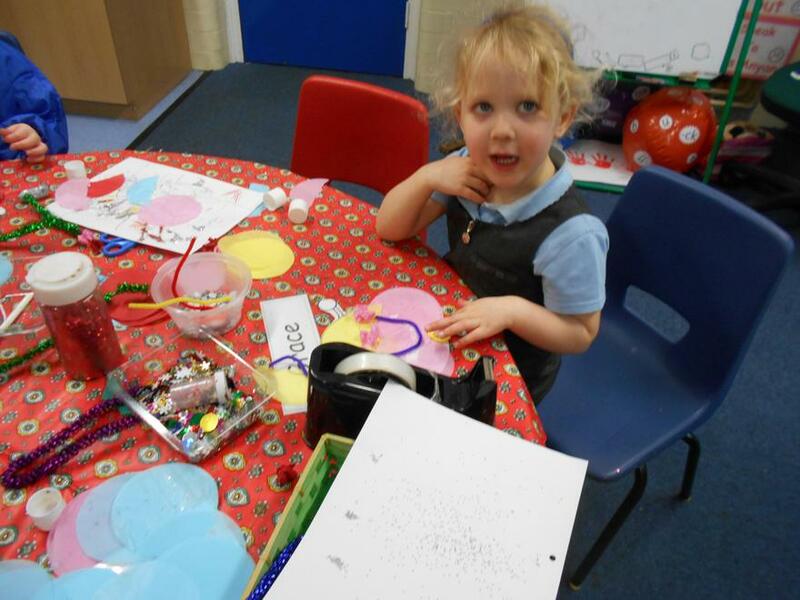 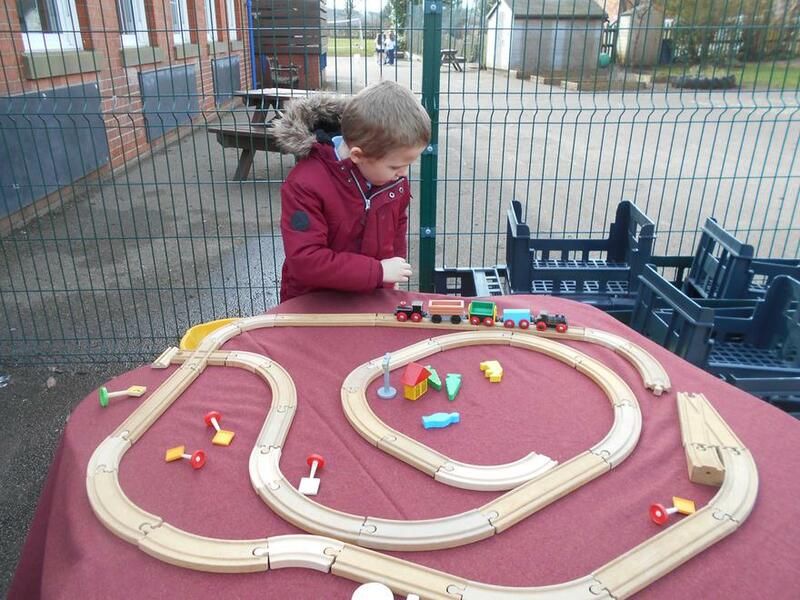 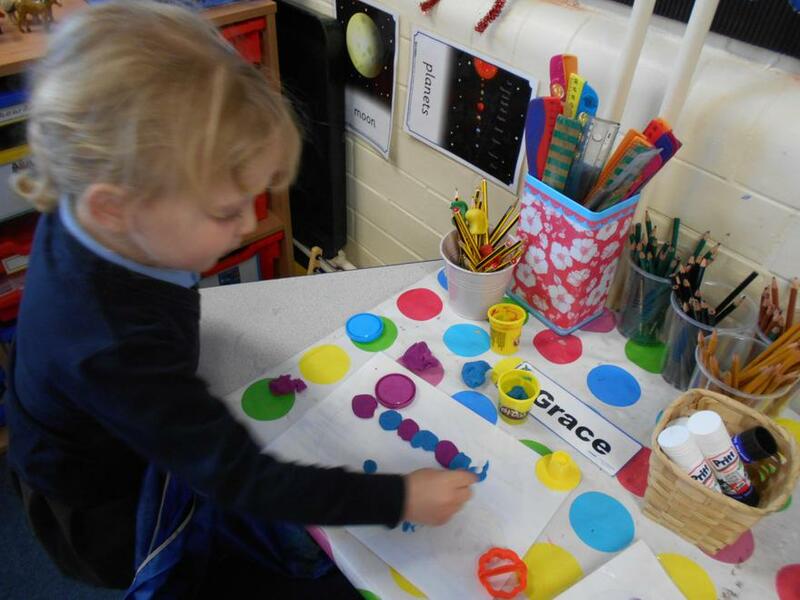 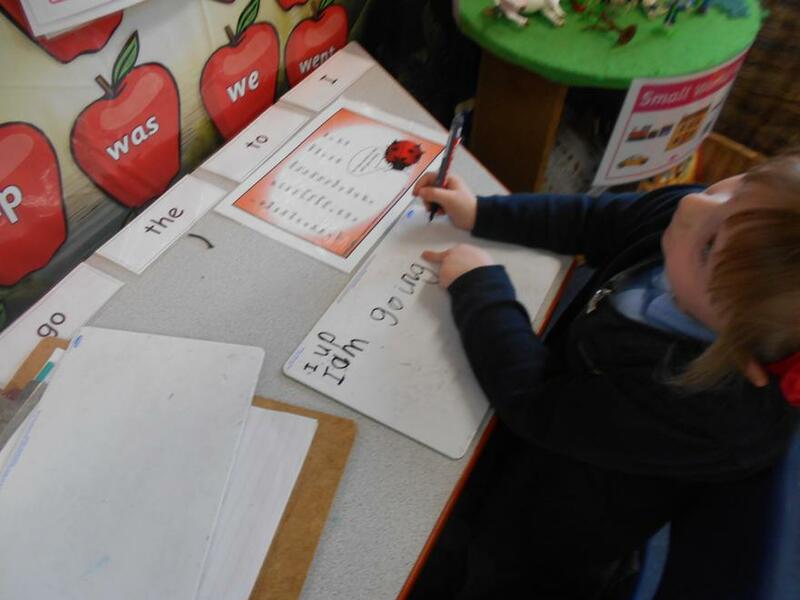 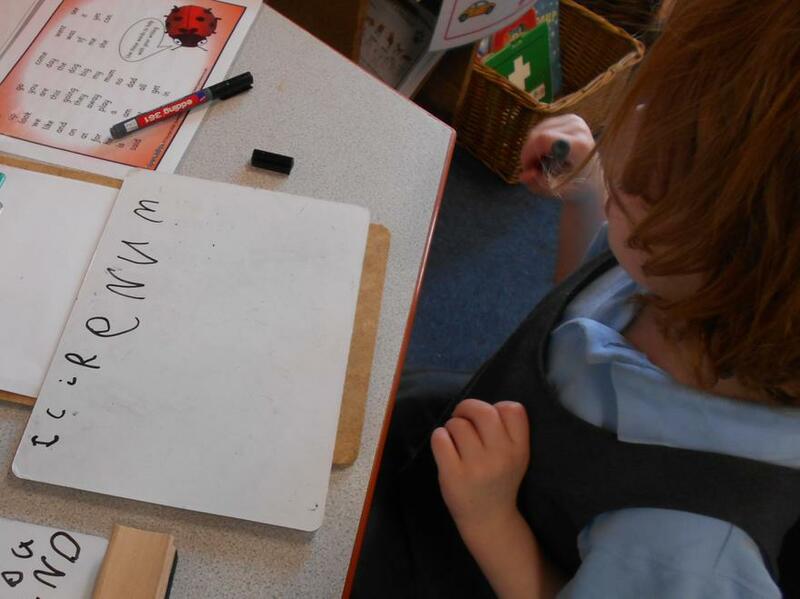 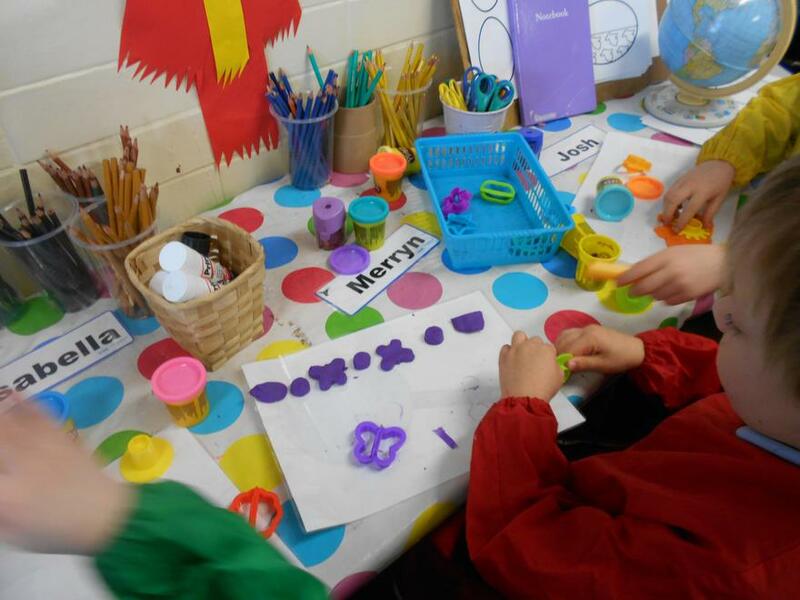 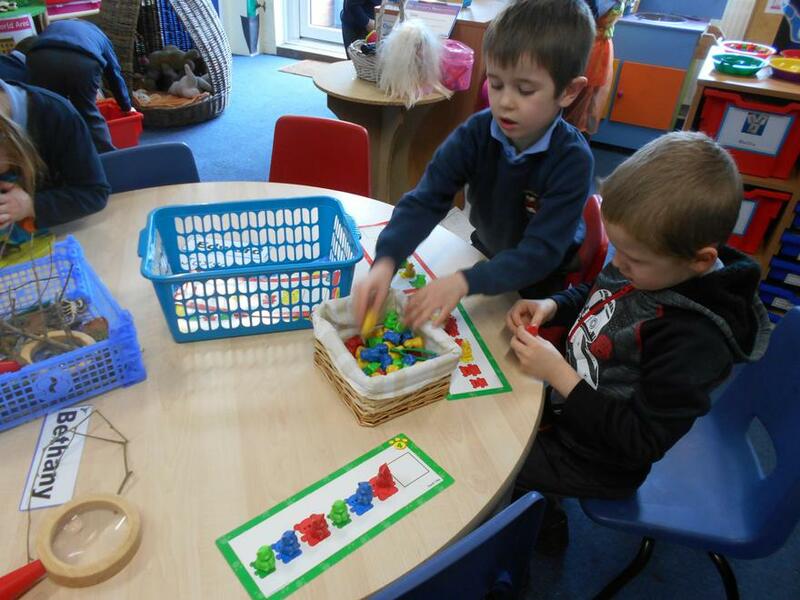 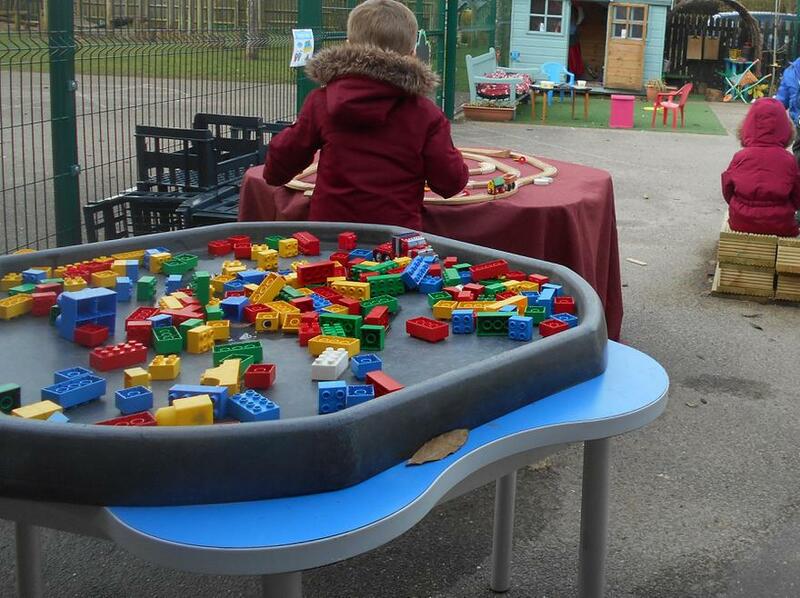 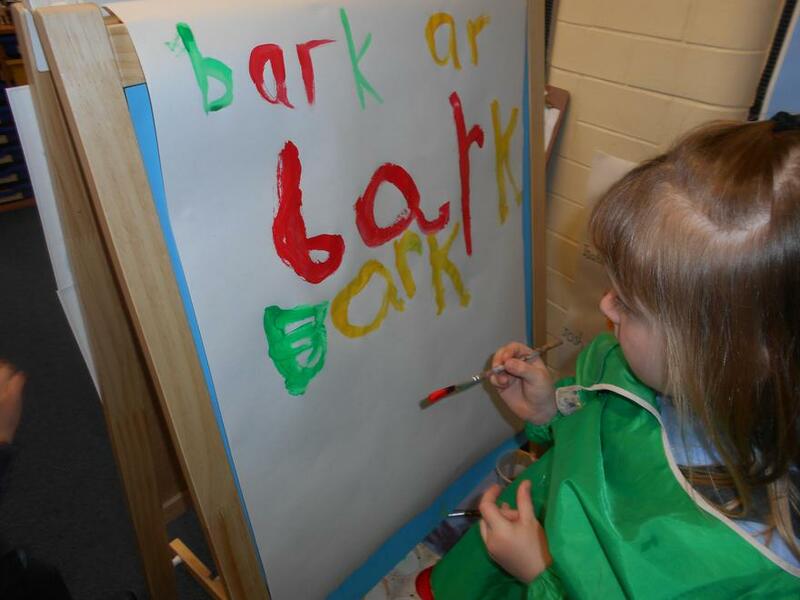 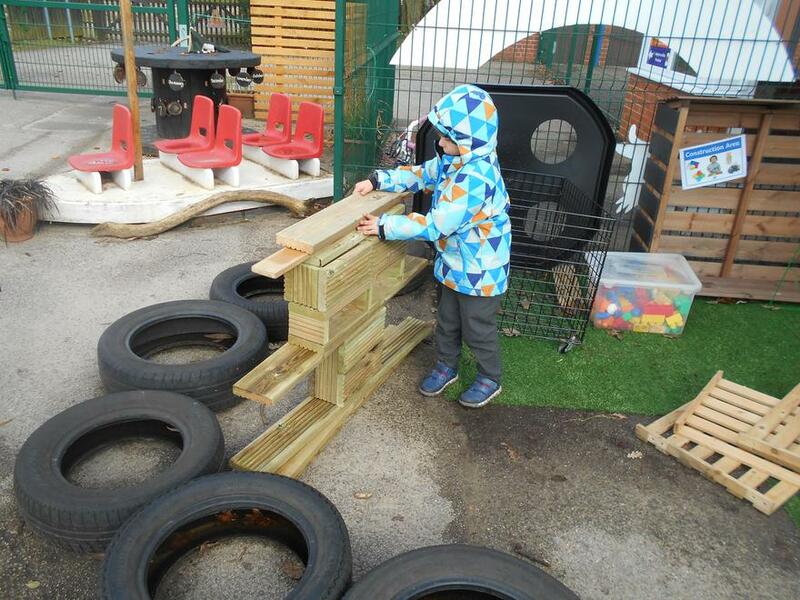 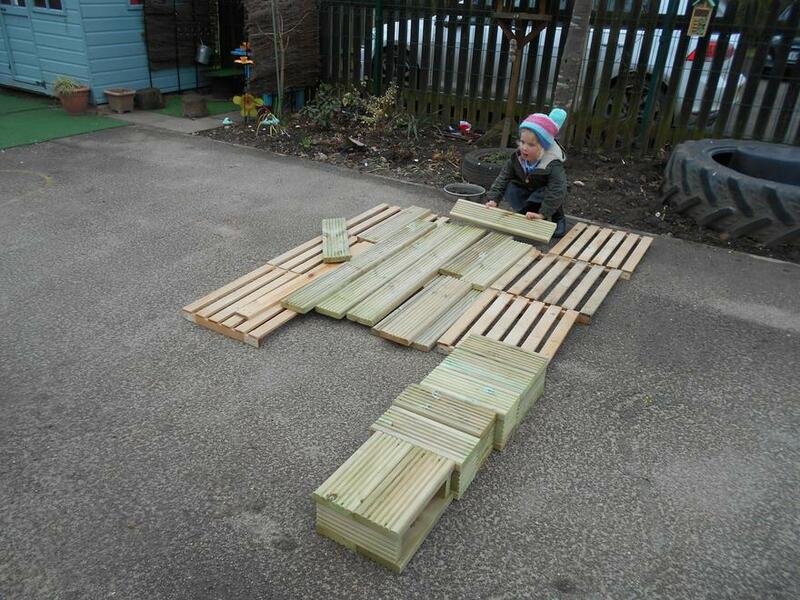 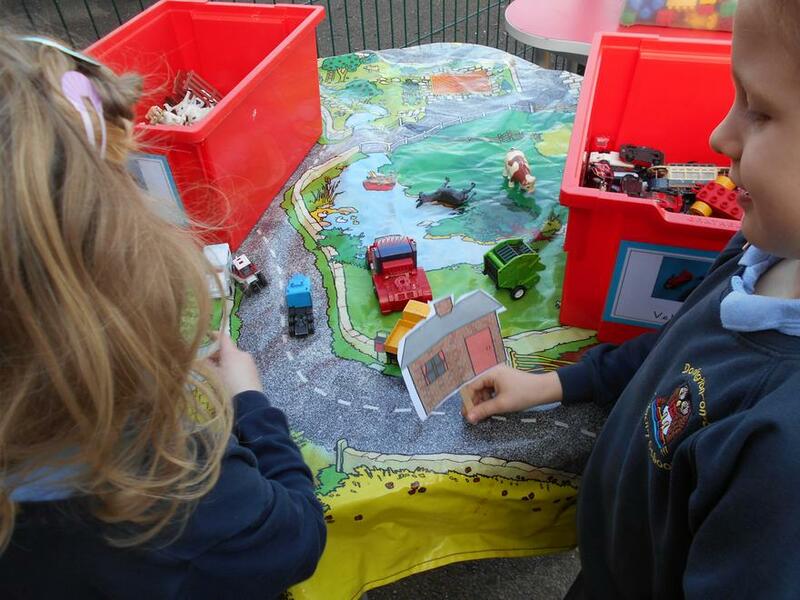 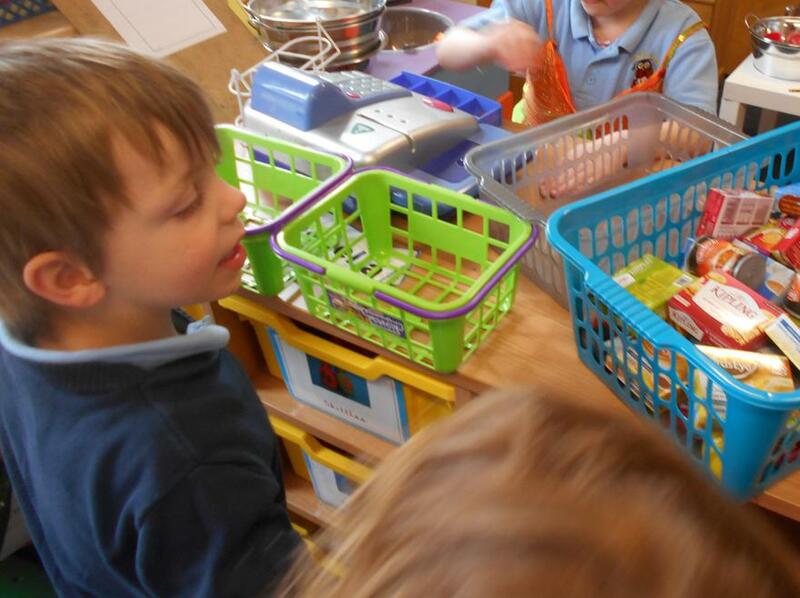 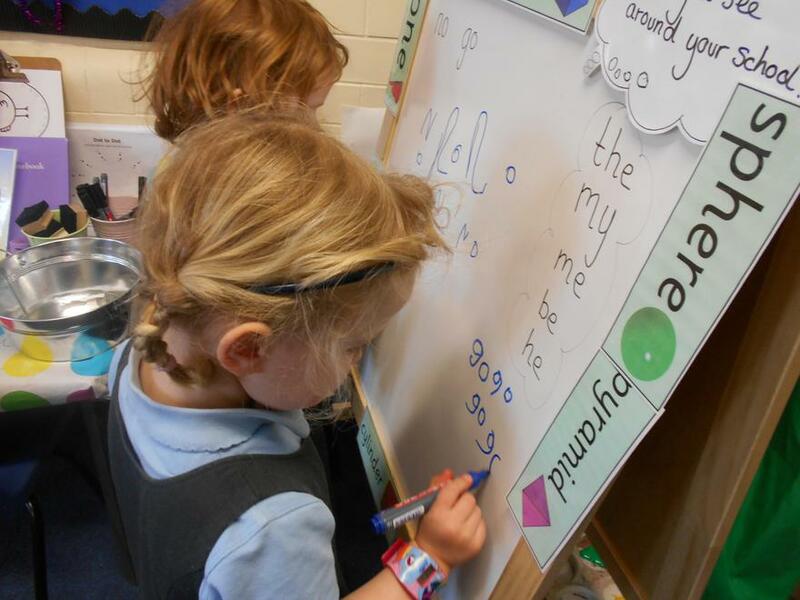 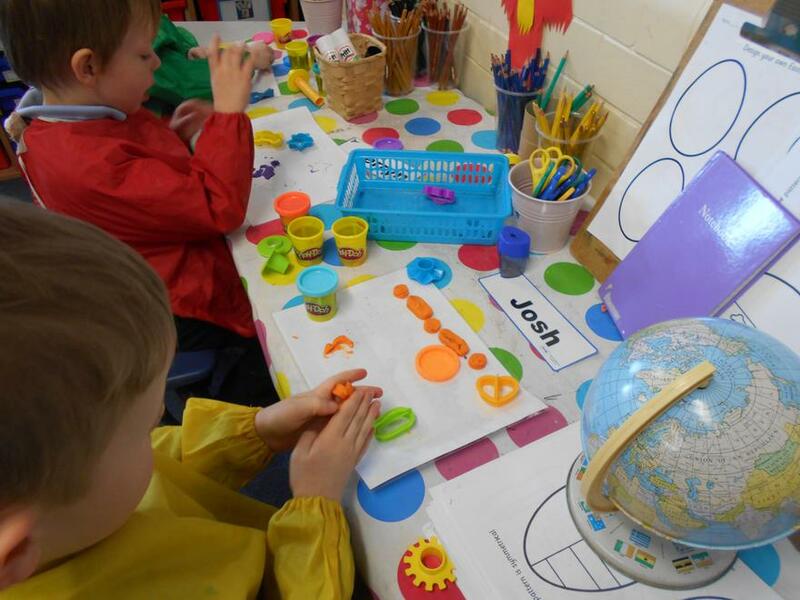 Through a combination of Child Initiated and Adult led activities the children have enjoyed lots of opportunities to practise their Literacy Skills (Writing) and Mathematical Development skills (Number/Shape Space and Measure). 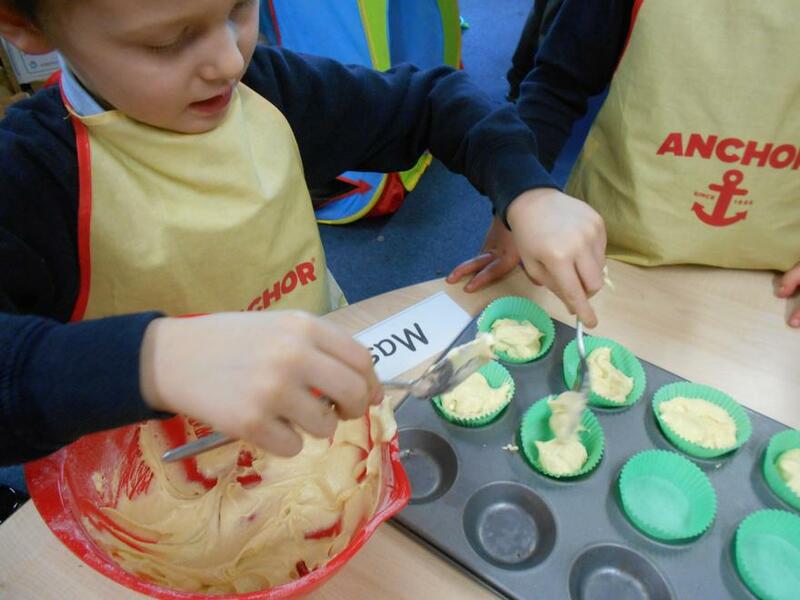 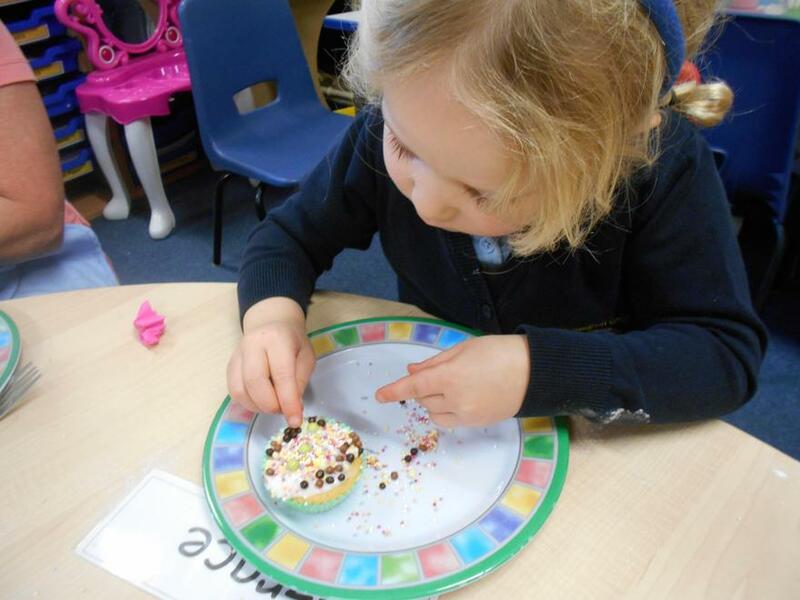 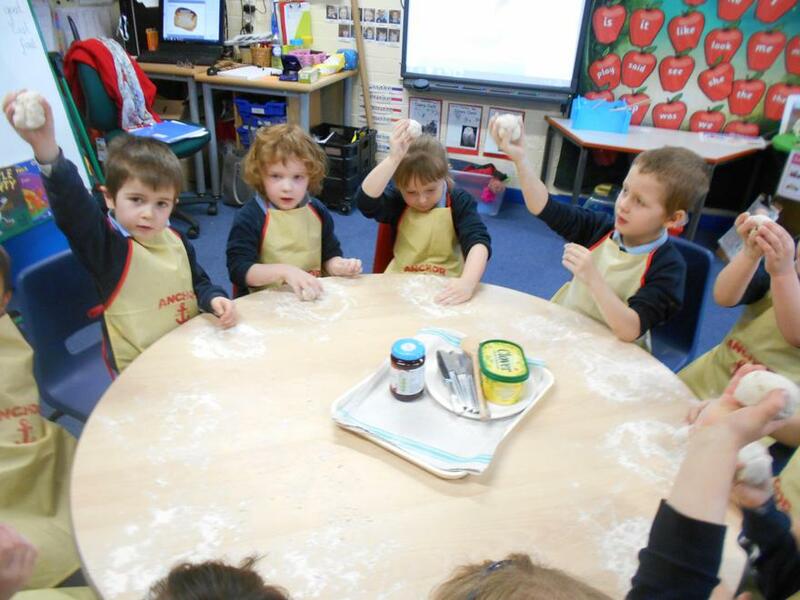 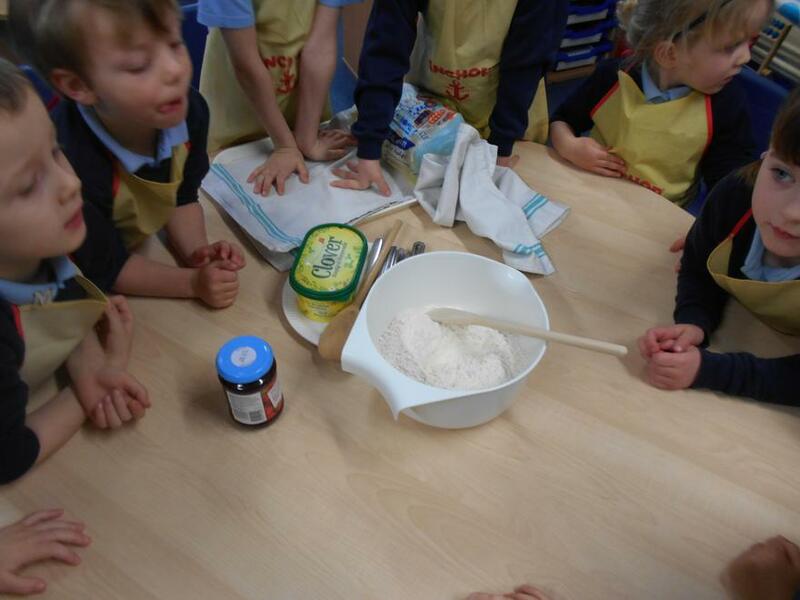 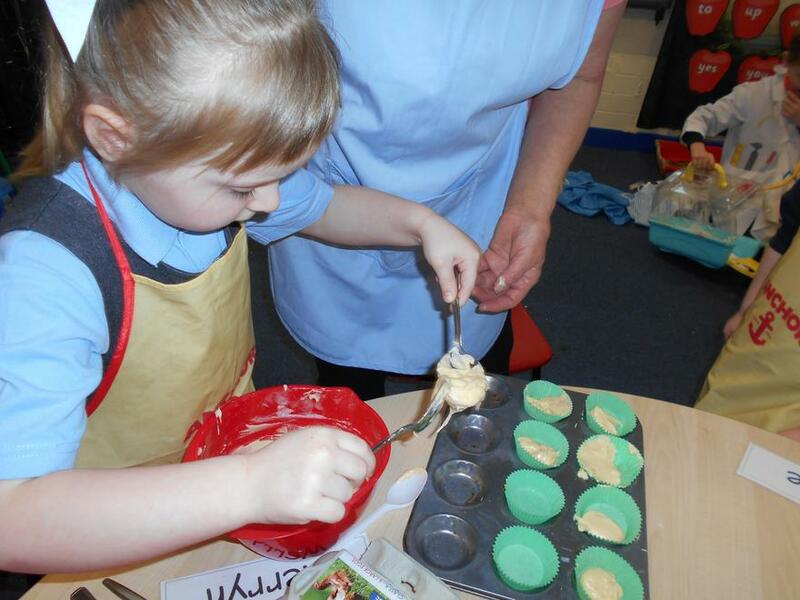 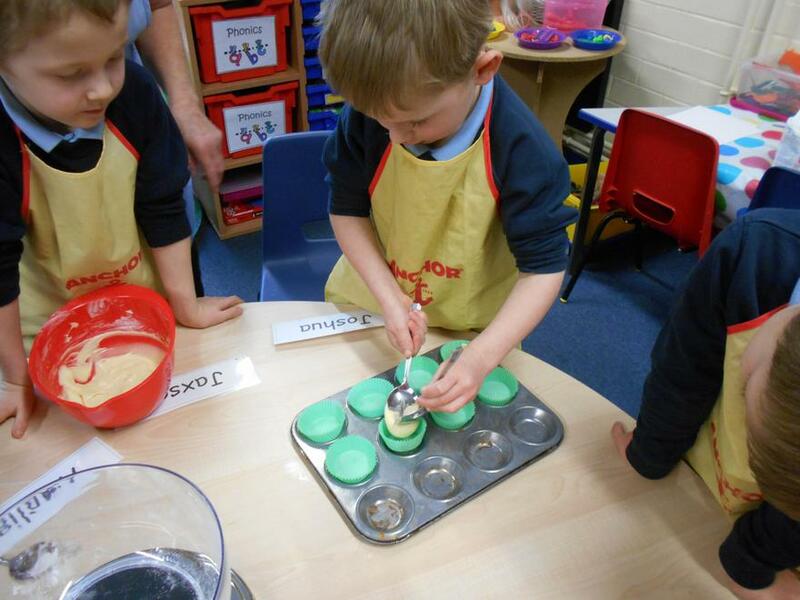 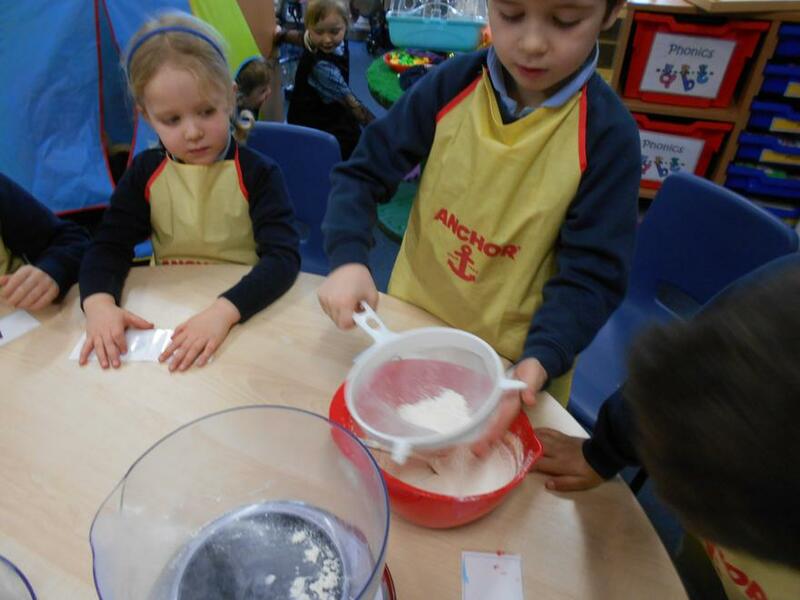 They learnt how to weigh, make comparisons, mix ingredients, sieve flour, fill fairy cake cases and decorate their cakes...oh and they learnt to use their senses to help them judge their cakes! 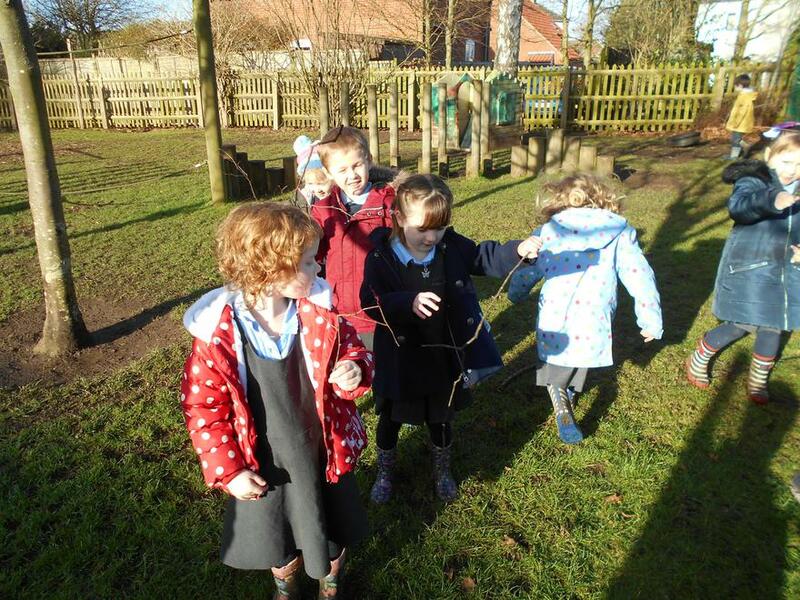 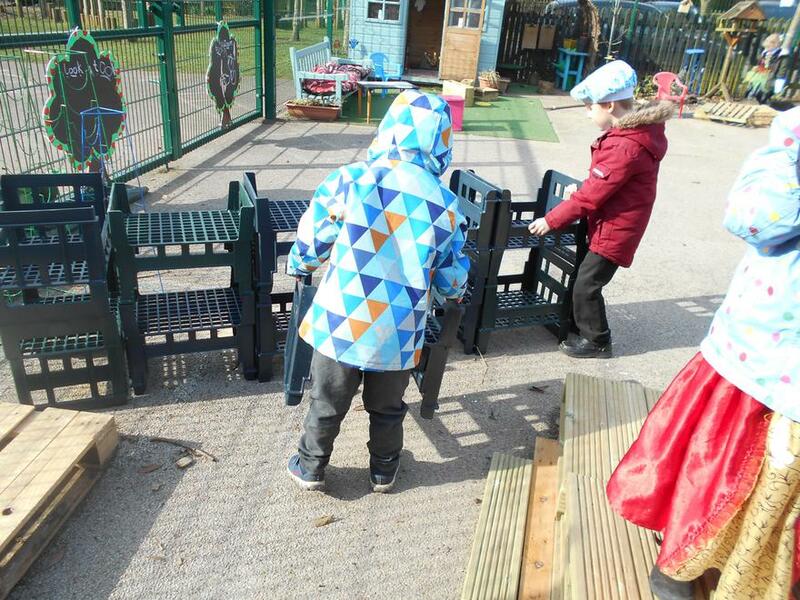 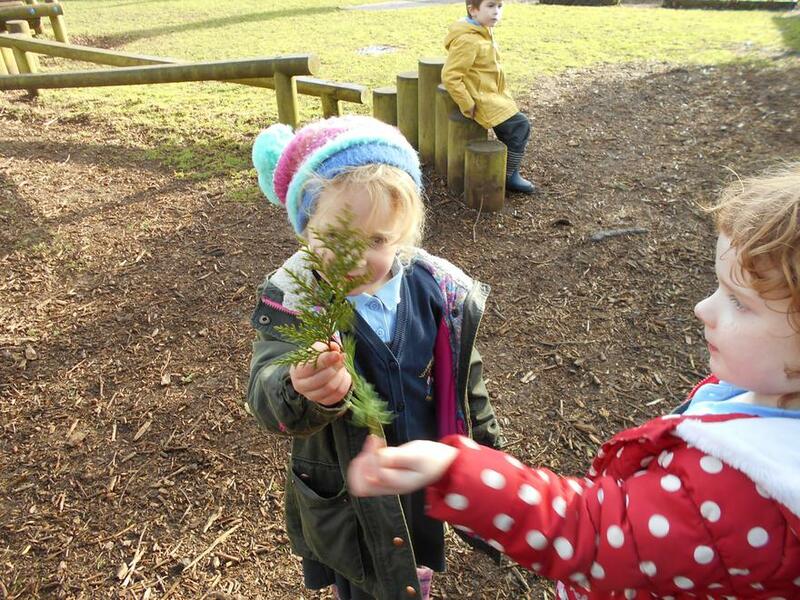 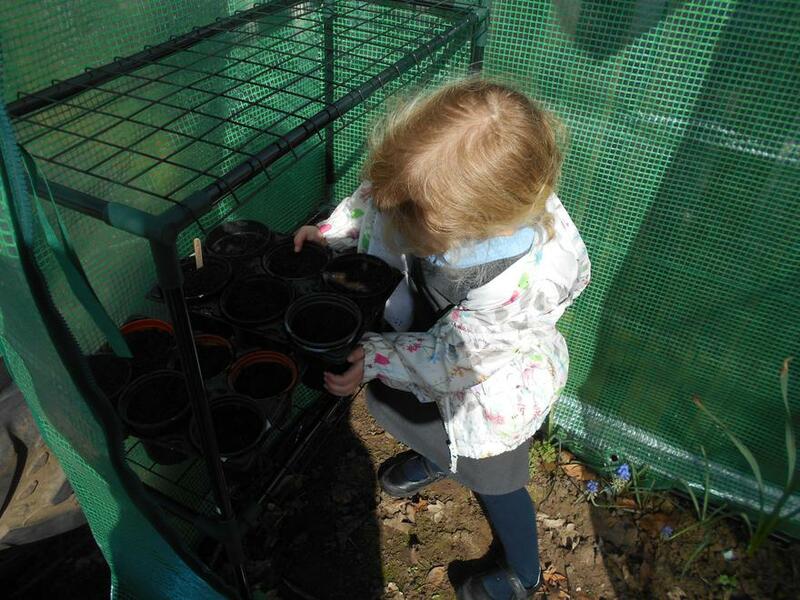 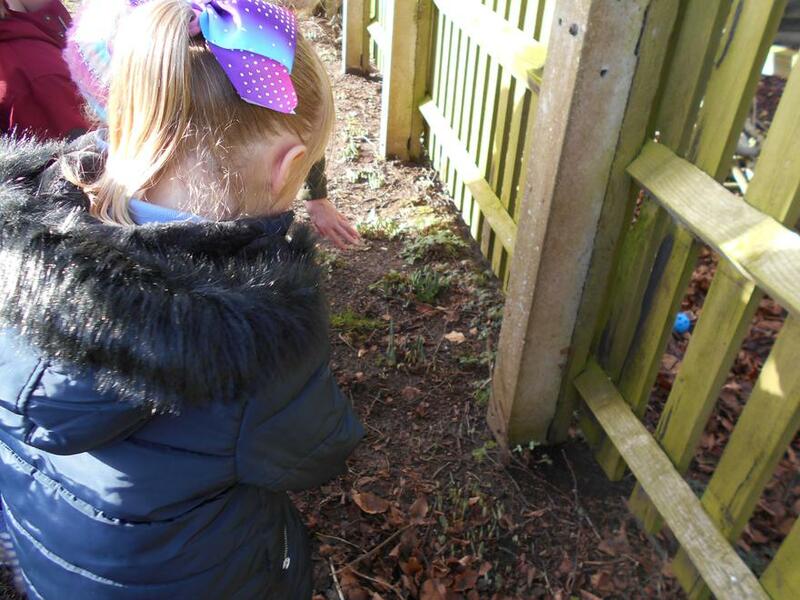 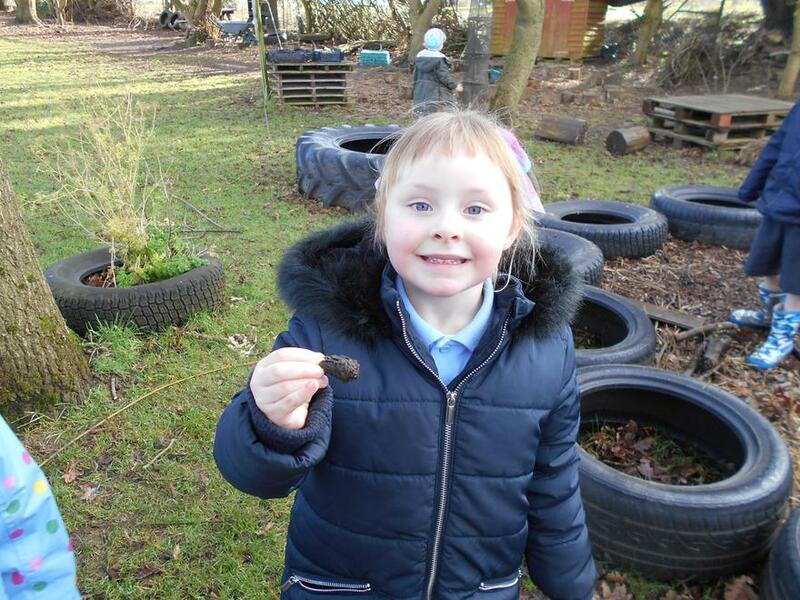 This morning the children were eager to explore their environment to find evidence of spring! 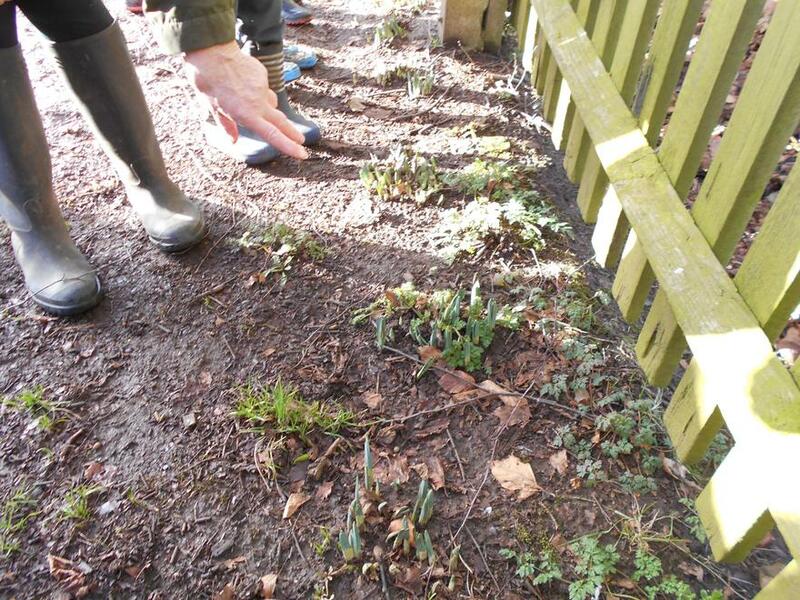 They were especially excited to discover young shoots peeping out of the ground. 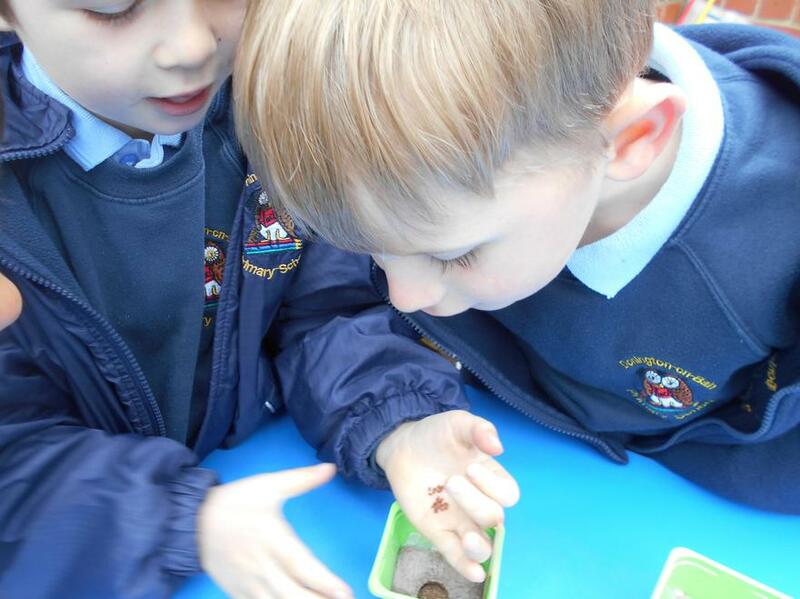 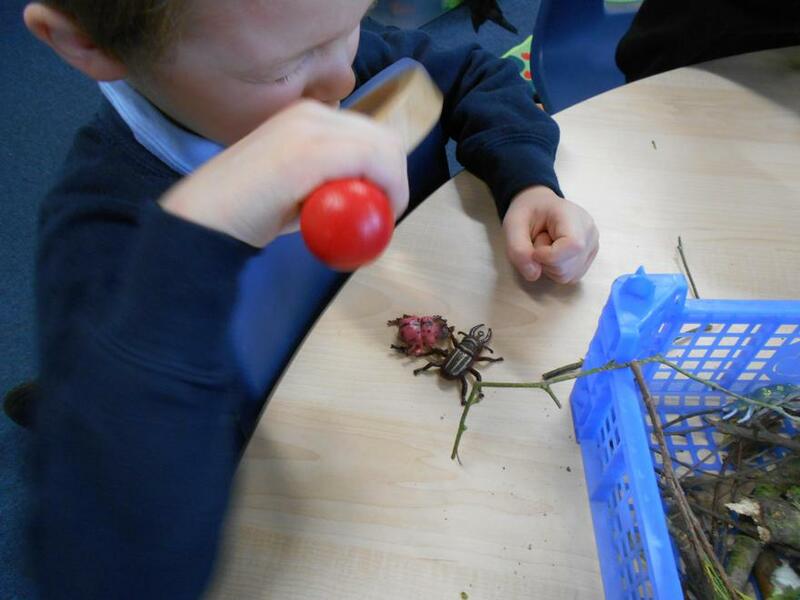 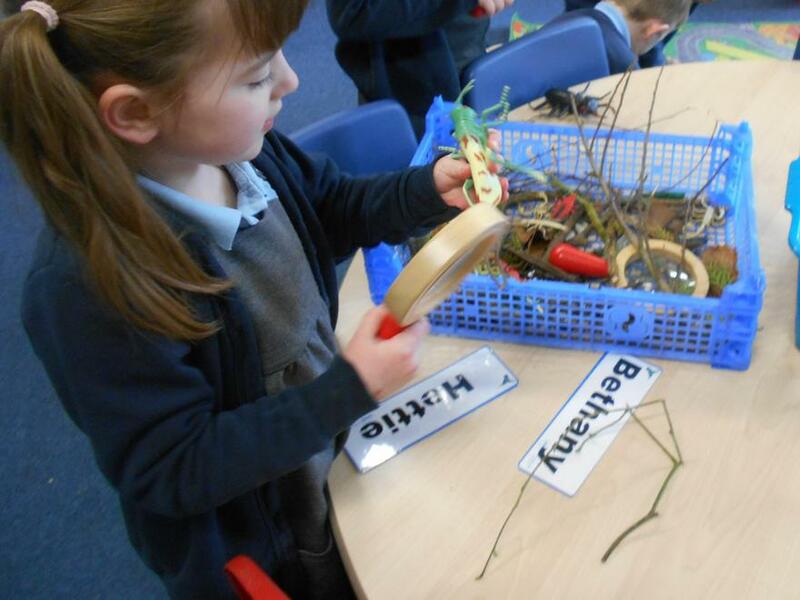 They were also intrigued to find mini beasts under leaves and twigs. 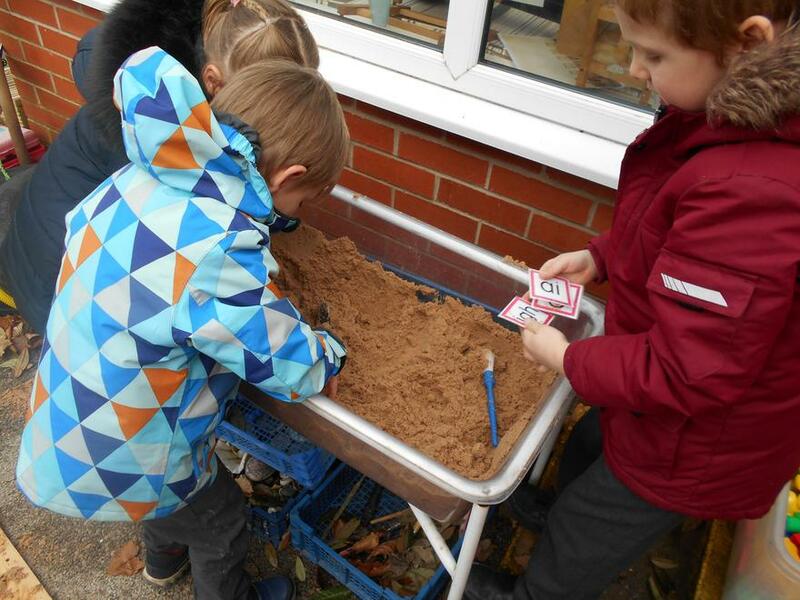 There was a lot of enthusiasm to explore their discoveries further. 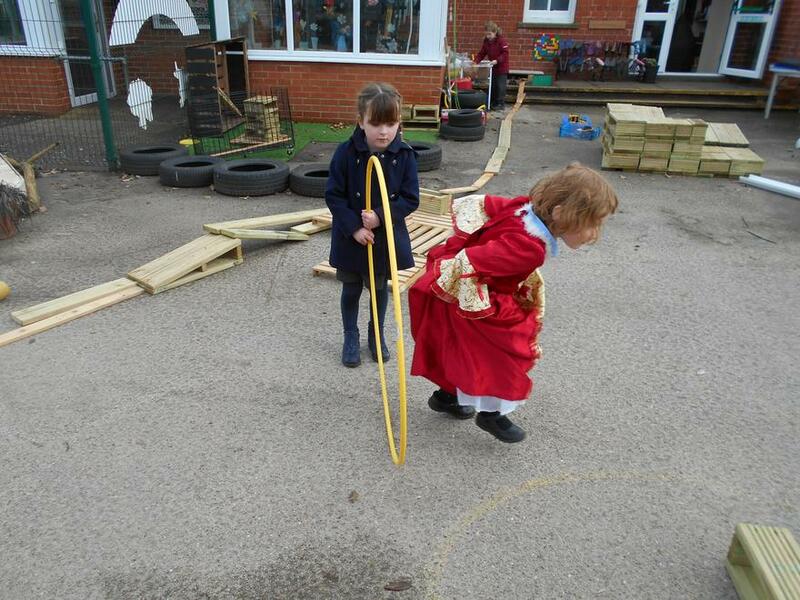 During the day we were very privileged to experience authentic Indian dancing. 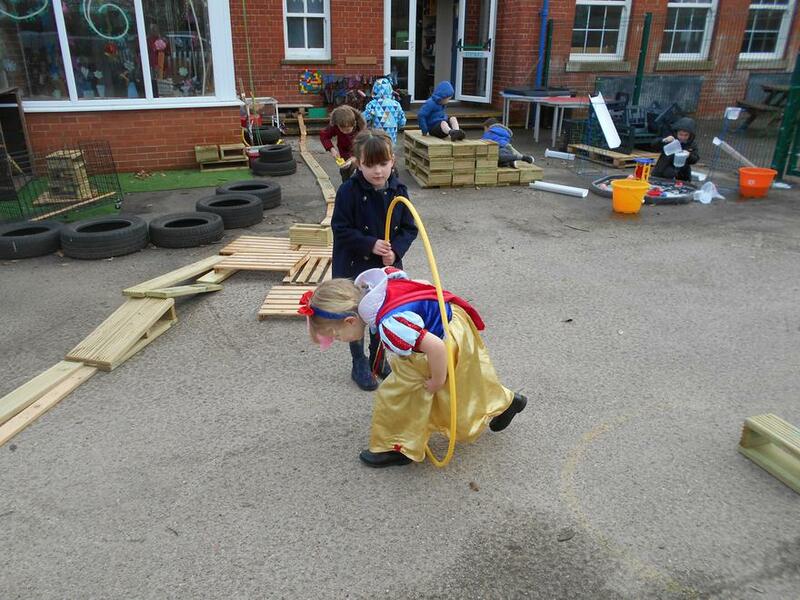 The children thought it was wonderful as they experimented with the different actions and moves. 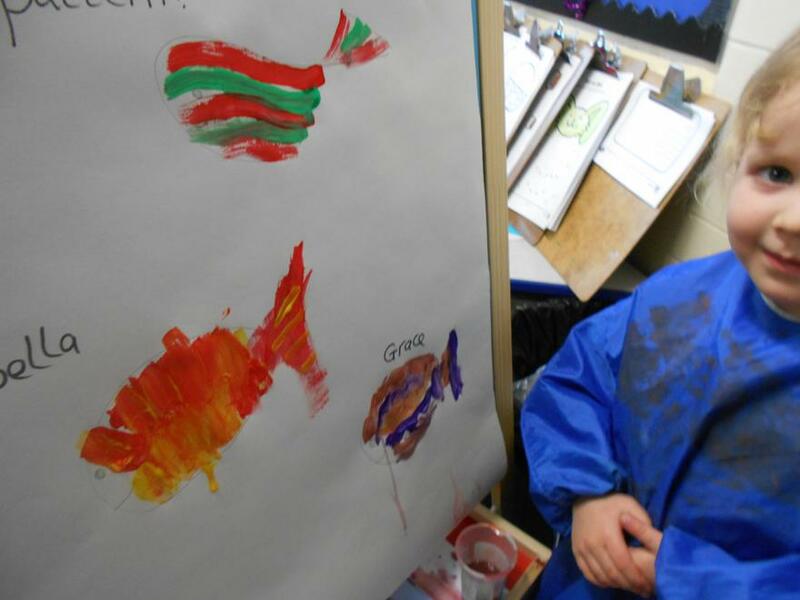 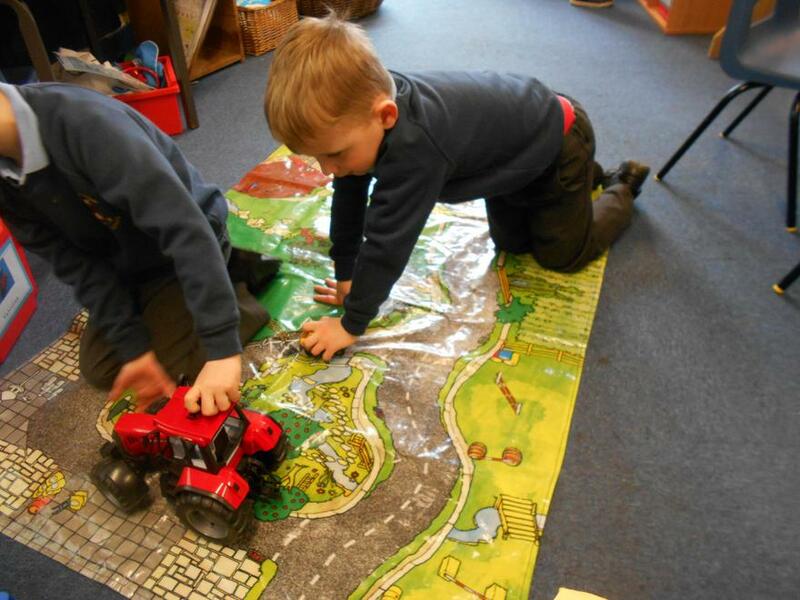 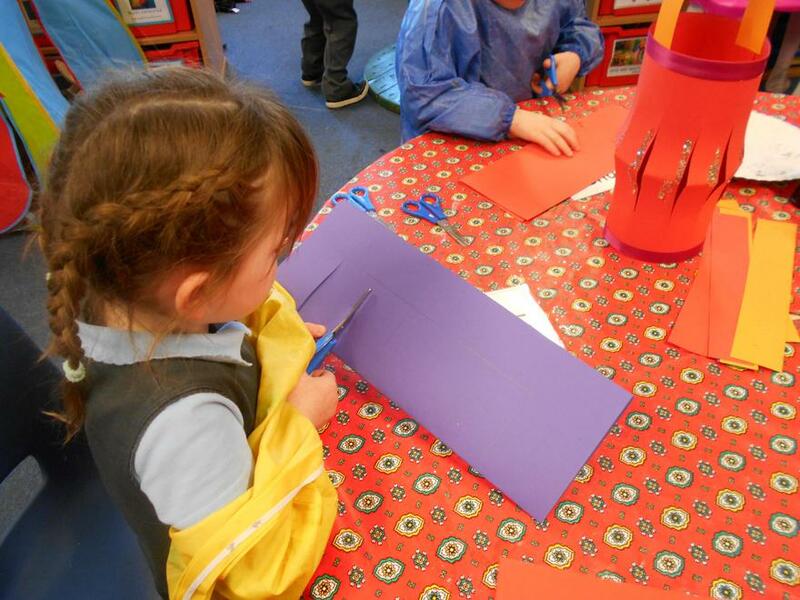 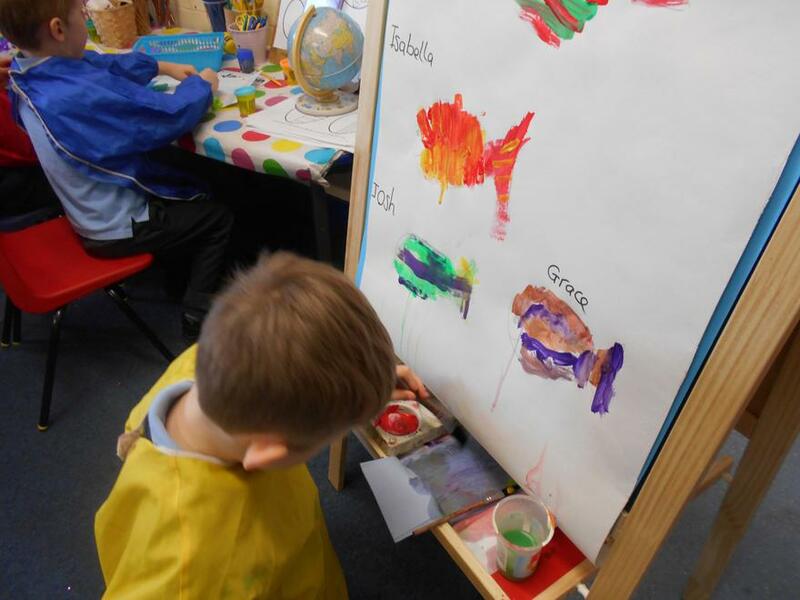 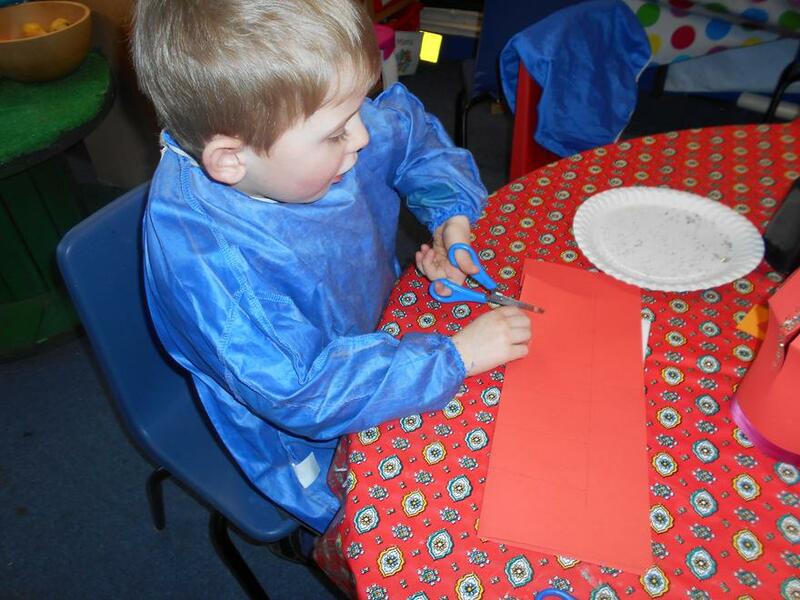 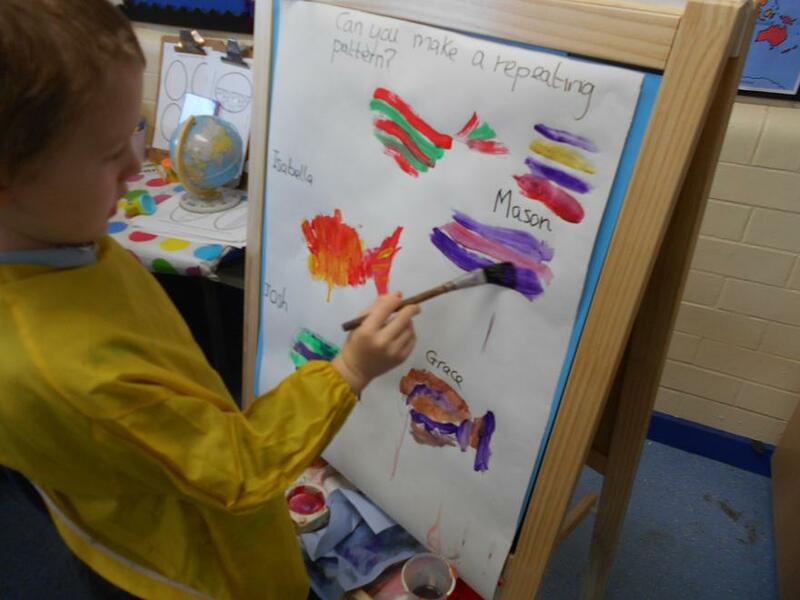 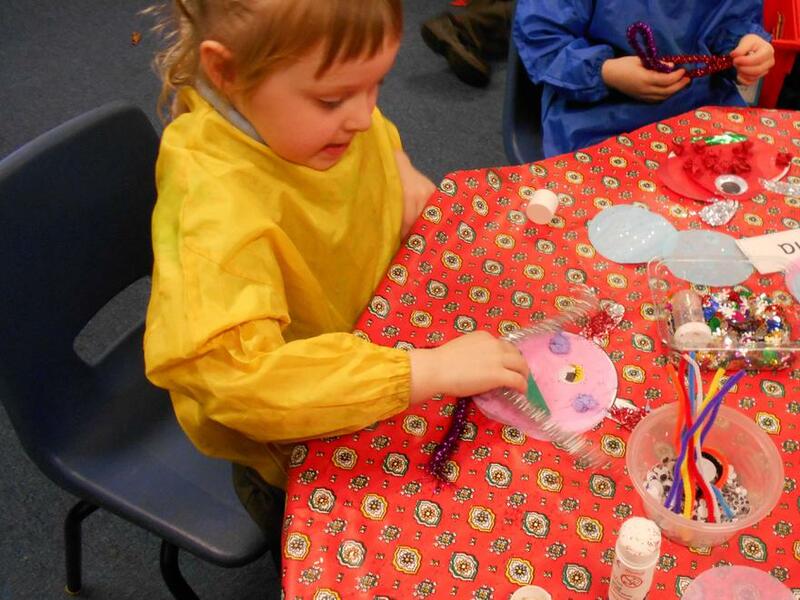 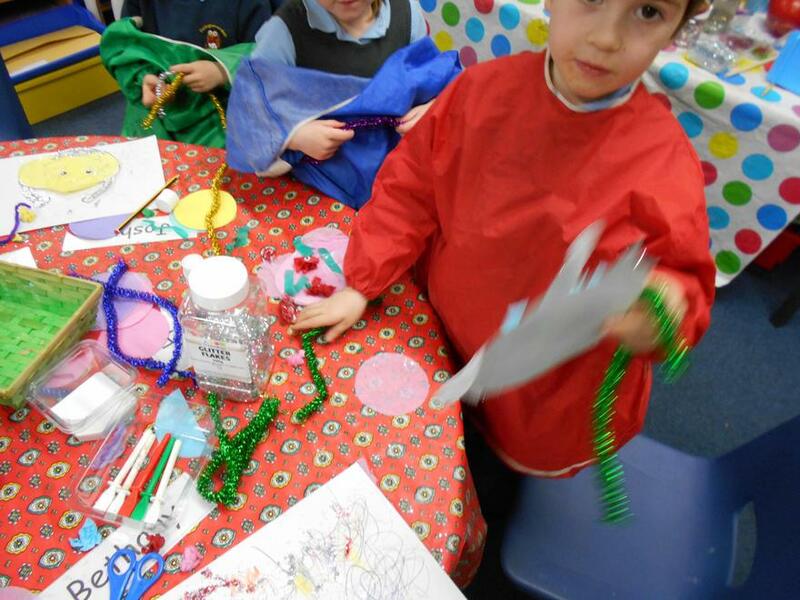 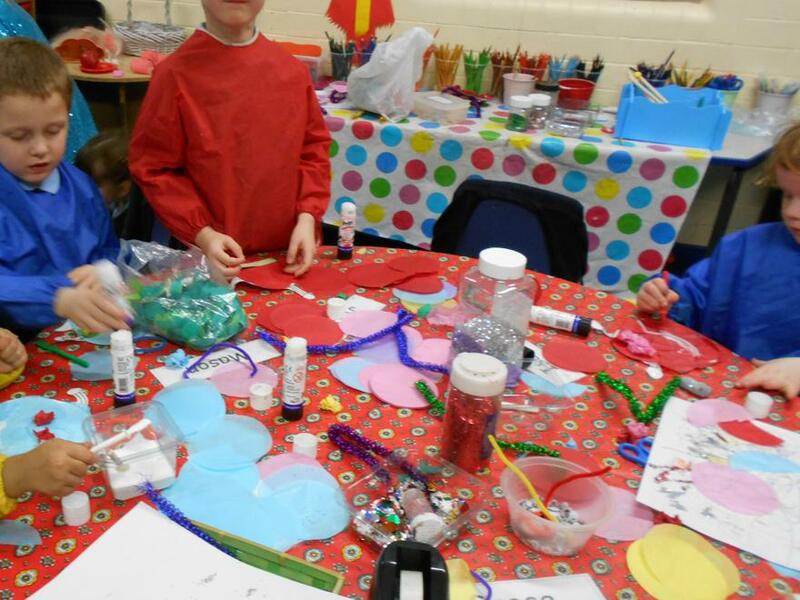 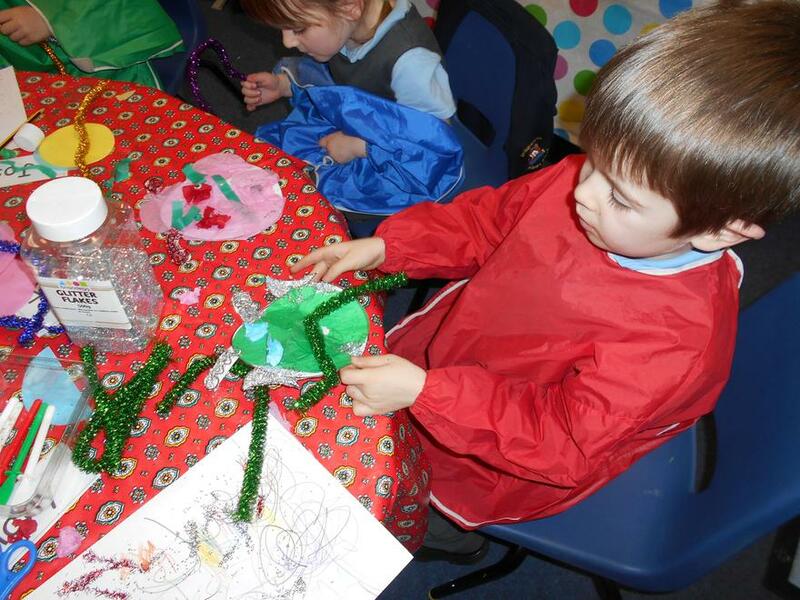 The children have been extremely busy having fun during the Chinese New Year celebrations. 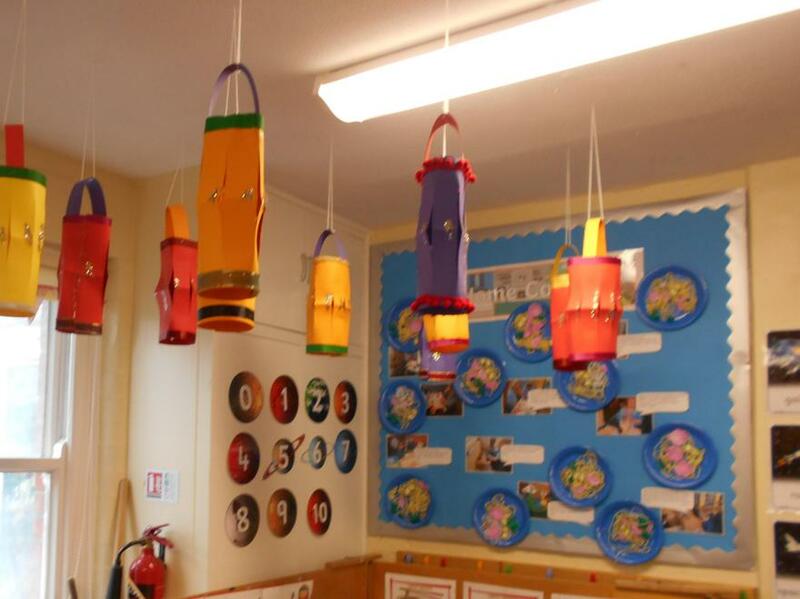 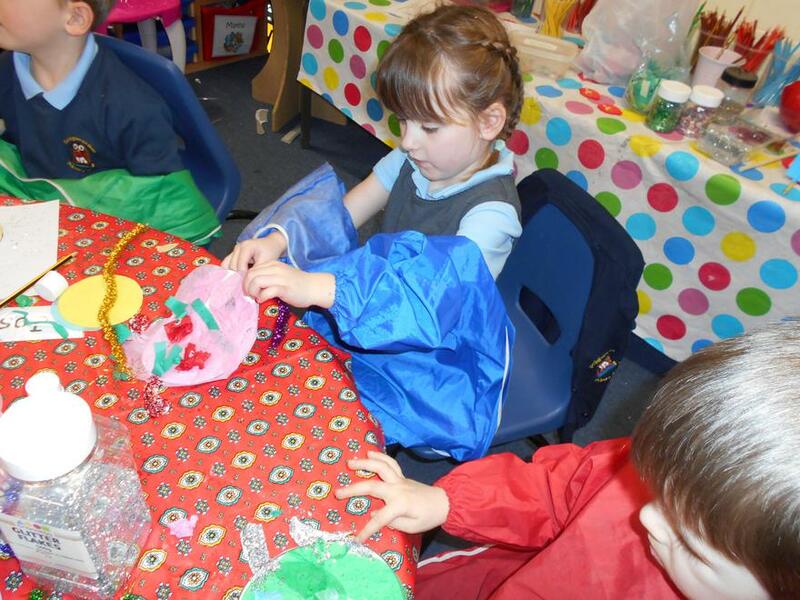 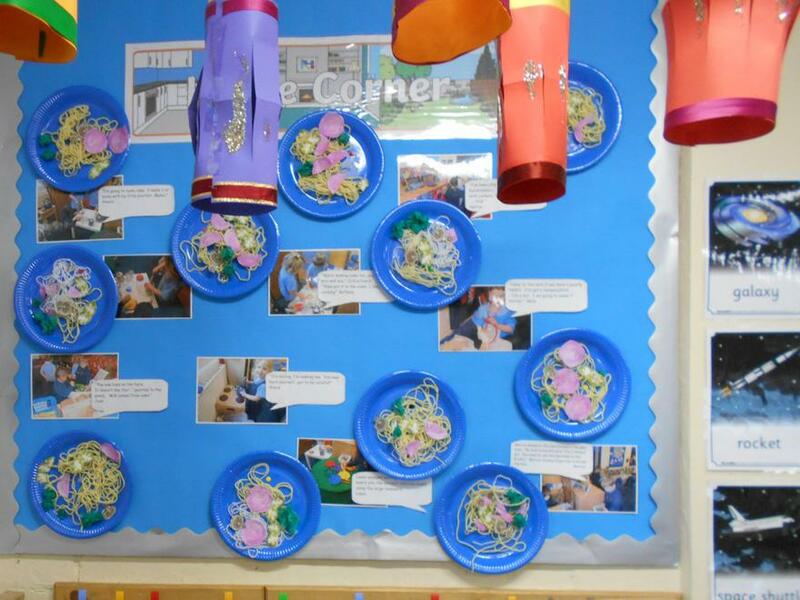 To celebrate the children created Chinese Lanterns, Chinese food plates, turned our home corner into a Chinese restaurant, watched clips of firework displays and created a Chinese dragon dance to name but a few activities! 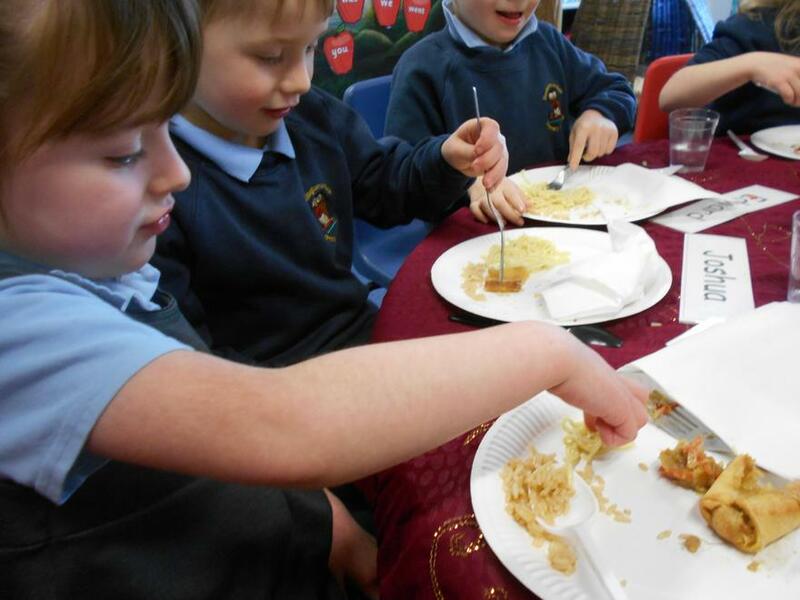 The children also wanted to carryout a Chinese food tasting investigation. 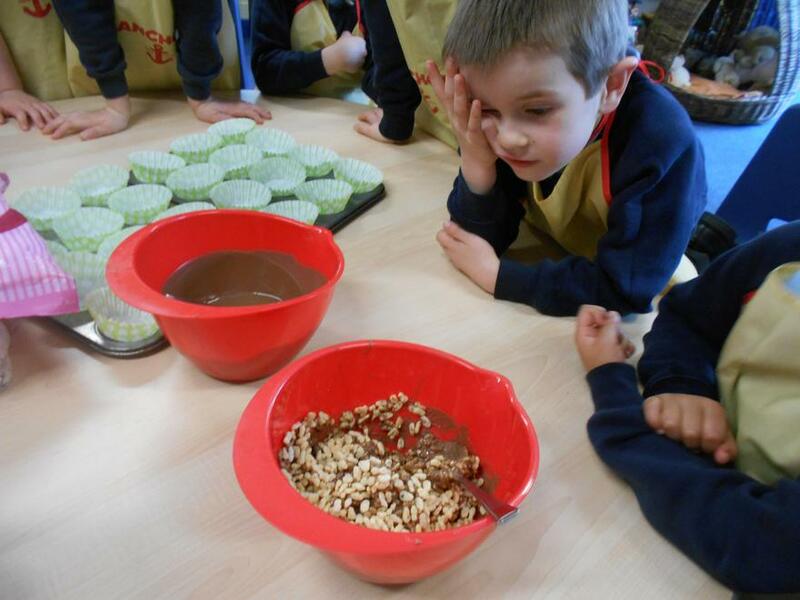 They used their senses to make judgements about each dish. 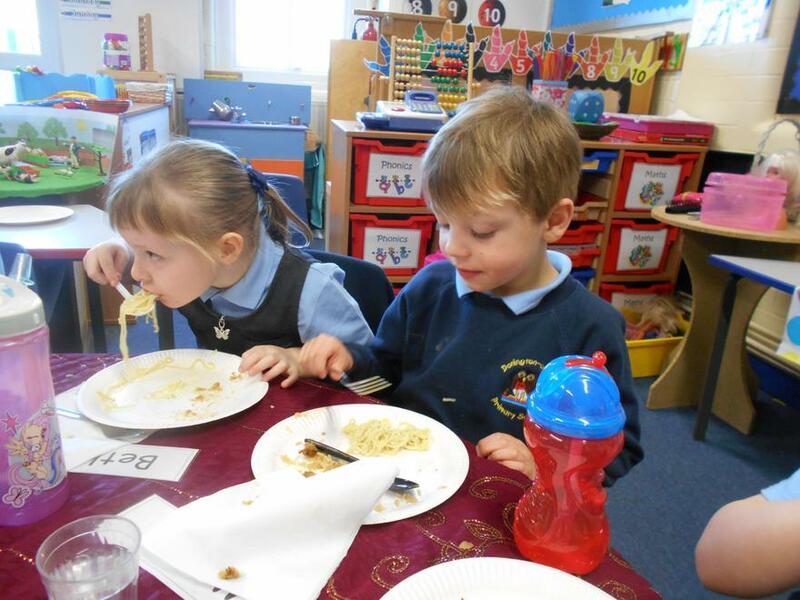 The children especially liked the noodles! 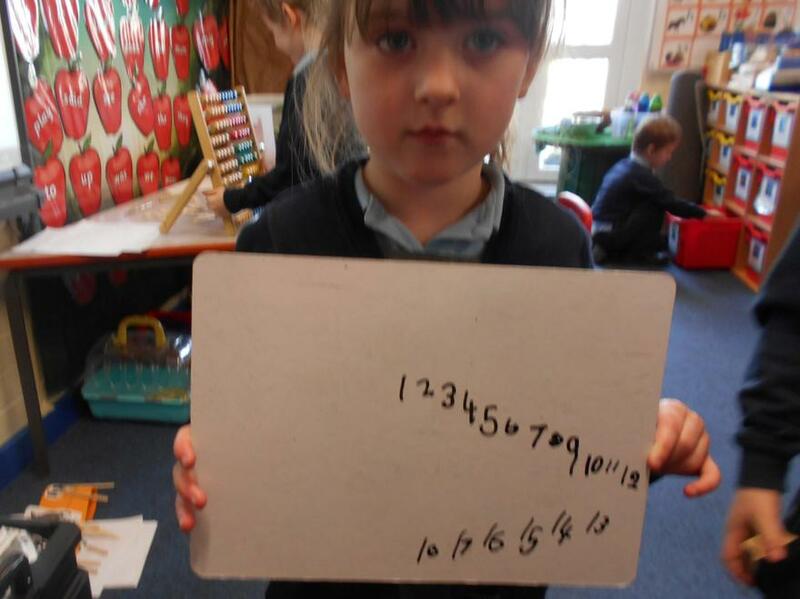 There was a lot of interesting expressions being displayed! 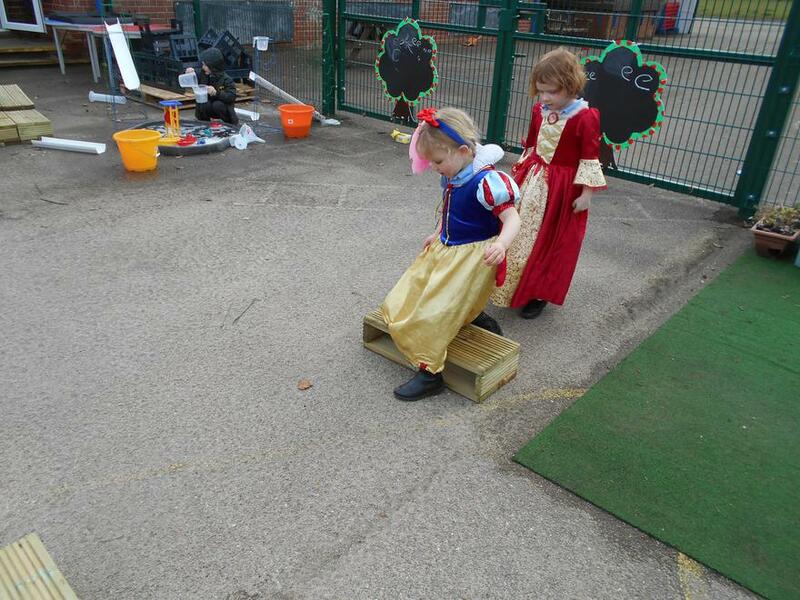 We all awoke to find a blanket of soft fluffy snow and of course at break time there was only one thing to do…have FUN! 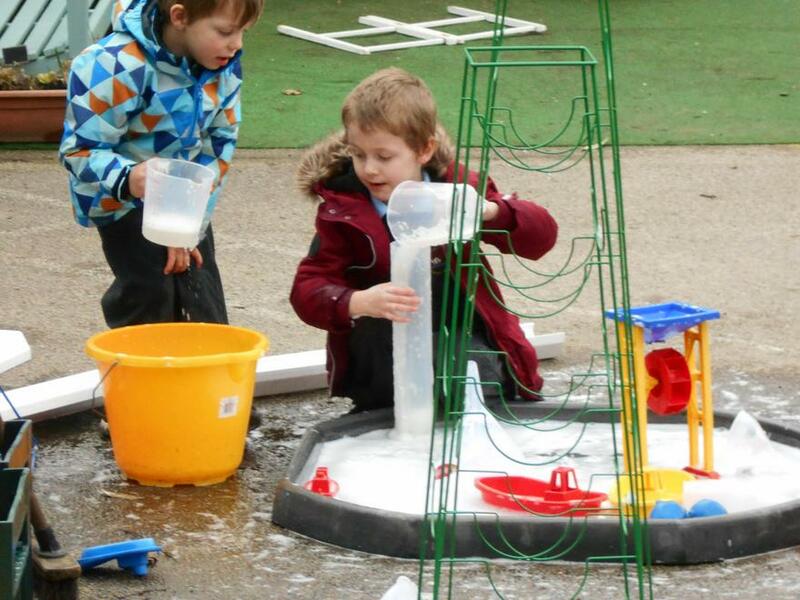 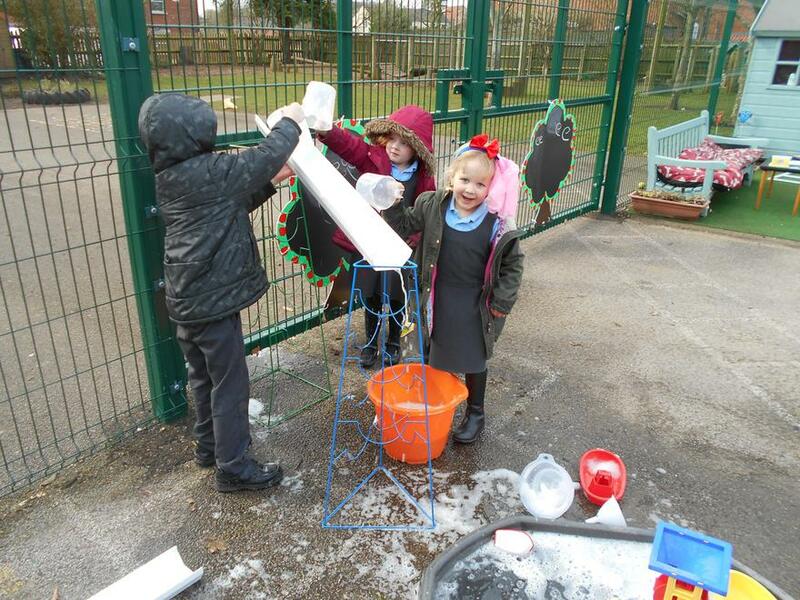 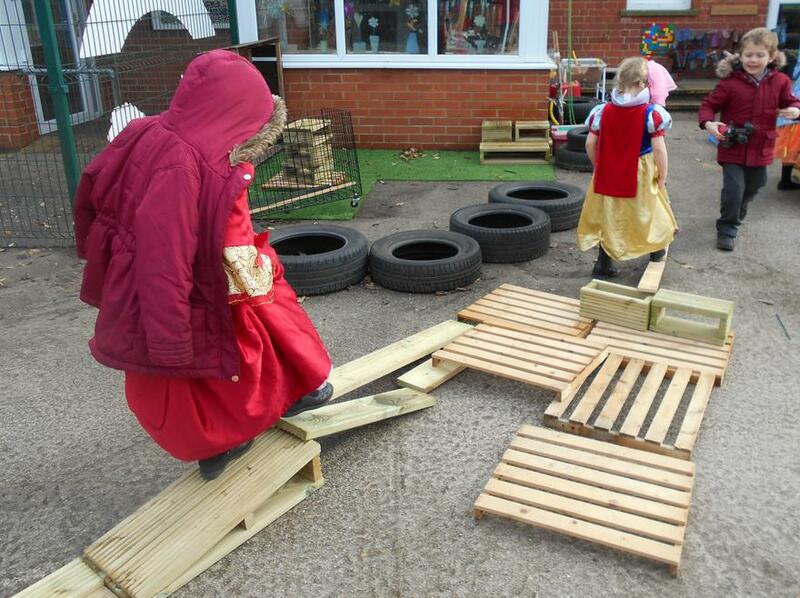 Some children were very inventive in their snow play! 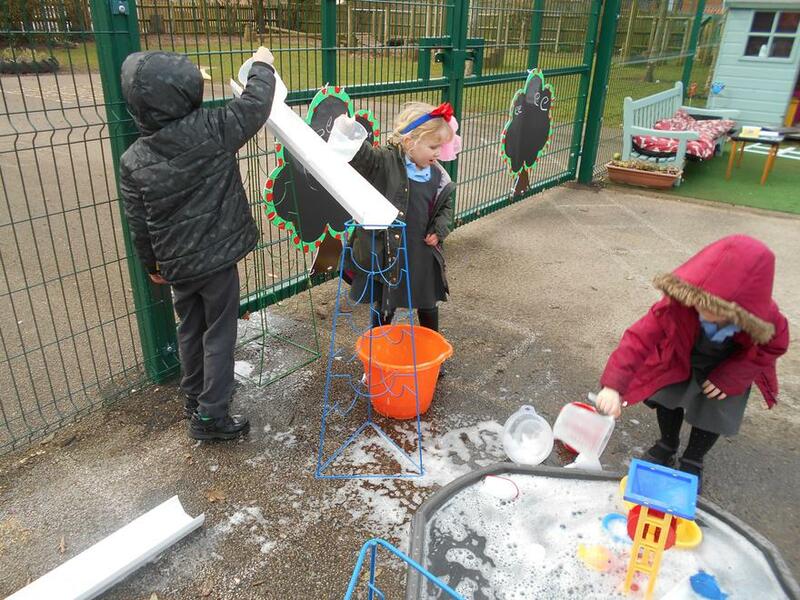 The Hummingbirds thought it was great fun to make snowmen, tracks, snow faces on trees…some even found different ways of travelling along the snow. 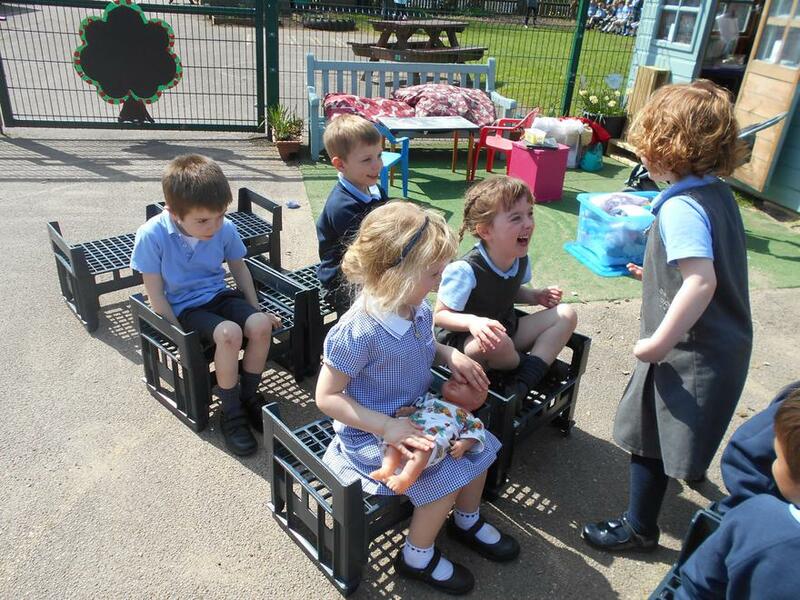 The children's imaginations have taken them on many adventures. 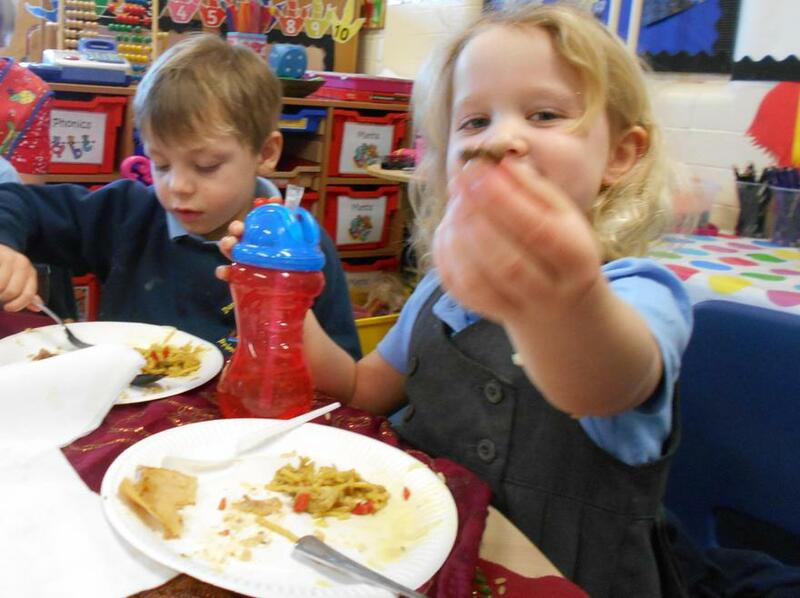 In the afternoon the children showed off their Yoga techniques to the school and parents which they had learnt in Janey's Jivers. 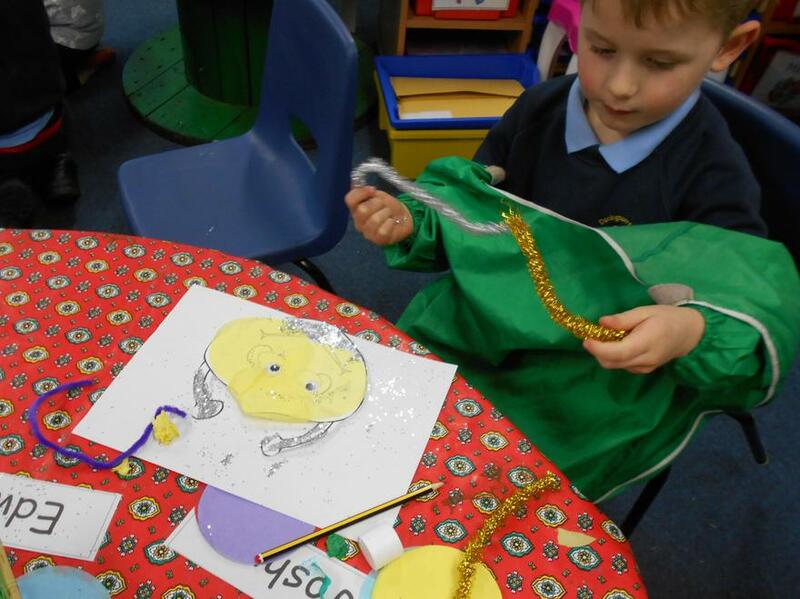 After the alien crash landing investigations there was only one thing to do…imagine what the aliens looked like! 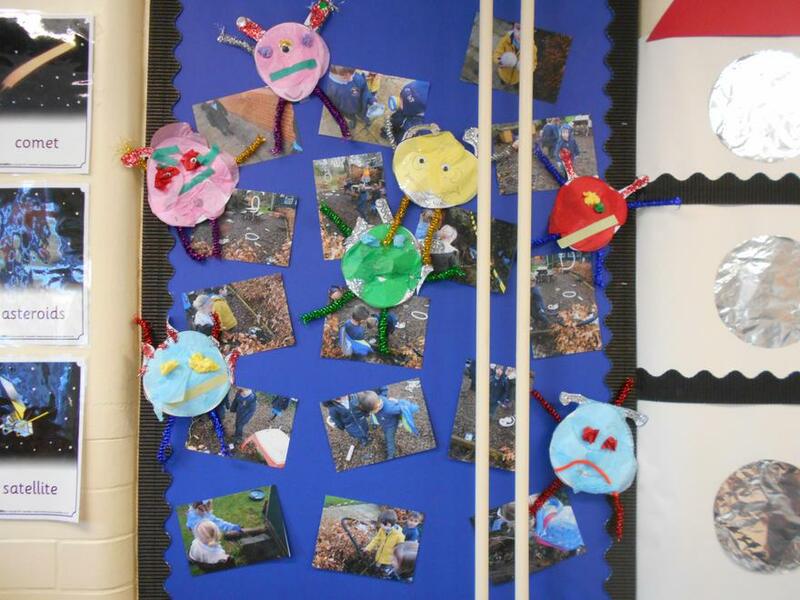 The children had fun creating their own aliens and even named them. 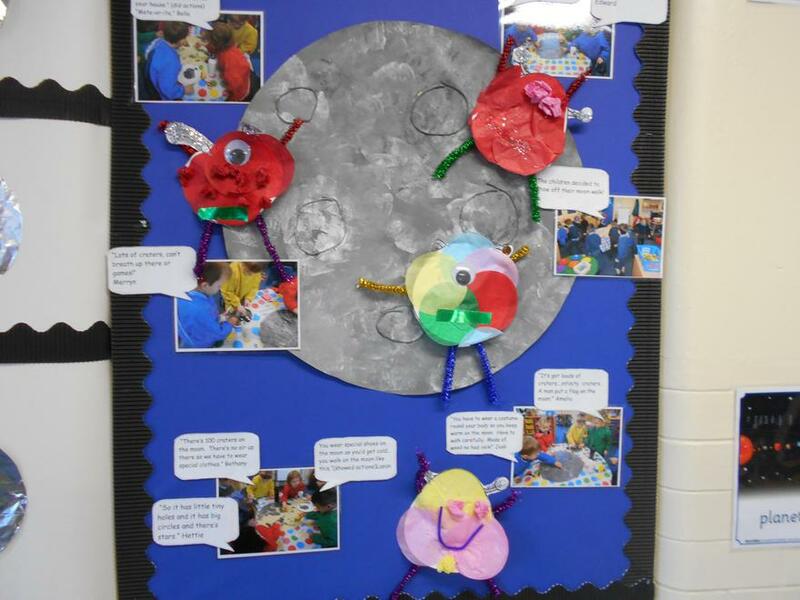 Many imagined that the aliens had come from the moon!